Our recent developments section is where you can find out about all of the latest projects we have going on at VPD before they make their way into our product catalog. Drop us a line if you want to work with us on any new projects. While waiting for spring, we are building engines and selling parts - especially Mikuni carbs - as car owners realize that changing to the mikunis is the best way to get a big bolt-on performance improvment. 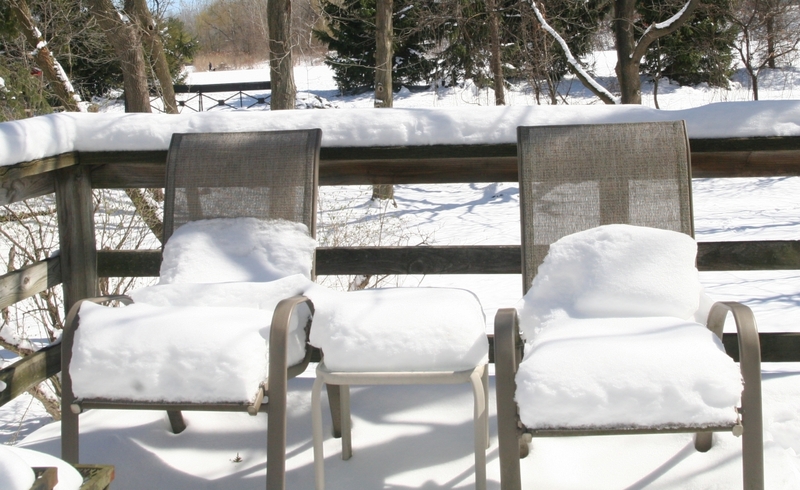 At the end of Jan., with over a foot of snow on the ground and highs averaging in the 20s but dipping into single digits ( both plus and minus ) earlier this week, this is the time of year when we get things done inside. The push is on to complete engines by spring. Engines and engine parts are everywhere, with some engines still coming apart for parts to use in the rebuilds and some going back together. The office is closed this week, back on Monday, but still taking orders and answering questions by email. Call my cell, 315 440 6560 and leave a message if you need to get me by phone. I hope all of you will be having a great holiday. The office will be closed from the 21st thru the 30th but I will still be corresponding and taking orders by email in preparation for shipping the first week of January. If you need to talk to me on the phone, call my cell - 315 440 6560 - and leave a message. Riley is no longer with us but our sons will be bringing 3 dogs. It won't be the same, but will help. One of the many amazing things that he did was understand presents. He could be trusted to look for and open hiis own presents under the tree, and understood that some were for him, and others were for the rest of us. Riley, my dog and best friend, died on Thursday. He had been with me everyday, usually 24 hours per day, for the past 11 1/2 years. There will likely be some delays in shipping and responding to emails and phone calls this week. Back from the trip to my son's wedding in Charleston - in the gazebo at Battery Park. We did miss the storm, as did Charleston. Usually would be catching up this week after a couple of weekends of racing ( we did have customer cars at both Limerock and Watkins Glen ), with while preparing for another weekend still to come, but instead this year I will be in the office and shop catching up on orders, so email or call if you have been trying to get in touch. Over the next 2 days I will be going over emails and tel. messages that I may have missed. My son's wedding on Sat. is my excuse for not racing this coming weekend at Watkins Glen. 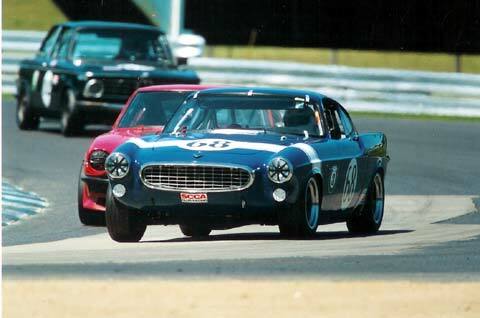 I've been going to that vintage race, usually one of the largest in the US, for 30 years now. I had planned to go again this year and was looking forward to seeing and racing against old friends, many of whom I see there every year. Its always been a special thrill to drive up to the grid, pass the grandstands and sometimes 60 other cars, to my place usually in the top 3 or 4 at the front. And then look left and right and see other cars and drivers I've been competing against for decades and can trust to go into corners a few feet apart. For this year I have a newly rebuilt engine with a few new tweaks that I wanted to try out. But my son's wedding plans have to take precendence. I thought of, but did not dare to actually suggest, that he do it at the track or postpone to another date. Instead it will be in the gazebo at Battery Park in Charleston, SC this weekend. So that's where I will be on Saturday, instead of driving to the front of the false grid or charging up the "esses" as in the photos below. Hopefully next year !! "Yee gods what a difference ...to say it goes better would be something of an understatement." Thats the comment we received from a UK customer a few years ago after a Mikuni installation on a Volvo Amazon. But after many comments like that from customers I am still surprised at the difference these carbs make. Last night I drove a Volvo 1800E that we had switched from fuel injection to the Mikunis, and the improvement was truly suprising - even after installing these carbs for almost 15 years. They are really awesome, the Car is running better than ever, and I have had it since 96, you and Nick are the best! I wish everyone had the opportunity to experience the difference. Its truly the best "bolt on" performance improvement that you can do. It can completely change the way a car performs. From a US TR6 customer, " Just finished the install on the mikuni’s and damn, what a difference. This car runs like it just grew another cylinder. " 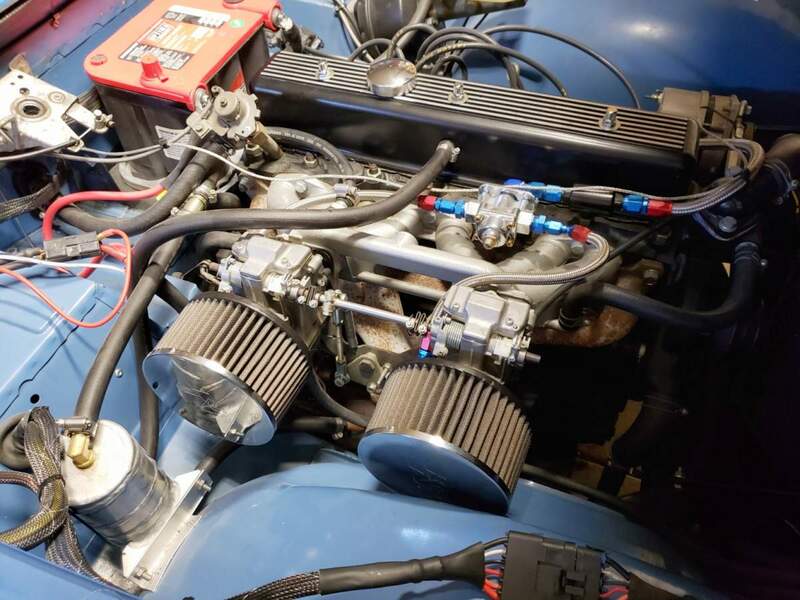 And after a recent installation by a UK TR3 owner - "The car runs like a dream , it accelerates like a scolded cat and has bags of low end torque ..."
The Mikuni HSR upgrade kit has delivered great improvements in power, drivability and tuning ease. The carburetors were nearly ‘spot on’ right out of the box with only a slight adjustment in jet needle height --- a 10 minute task—required to dial in part throttle feel. The robust design of the HSRs have eliminated the need for seasonal recalibration as well as allowing complementary upgrades like vacuum advance and an evaporative system. I’d like to order the Choke Cable Bracket system. Please let me know final price with shipping, I’ll send payment via PayPal to your email above. We will be out town for a few days, but will continue to process orders by email. Back next week. as the basis for a customer engine build. Please let me know if you have or know of one that is available. Lowering springs and Bilstein shocks are now coming in, after a long wait. The numbers are still limited, with more on the way soon, but if you have been waiting for our progressive rate lowering springs and Bilstein shocks, now is the time to get you order in. On the springs, not all ride heights are available yet, but will be as more come in. Bilstein as been out of the shocks for the 1800/122 in the US since last fall, so this has been a long wait and the first time that we have had to wait anywhere near this long for them to re-stock. Please let me know if have any questions. Hoping for an early spring, but another foot and 1/2 of snow so far today makes that unlikely. A machine shop north of here had to cancel doing finishing machine work for us, while they dug out with a loader, so we won't have those parts until at least tomorrow. But its good weather to sit in the shop and work on engines and we have a bunch of them to finish. Back Tuesday 1/30 by late afternoon. If you need to reach me before then, send an email or call my cell - 315 440 6560 - and leave a message if I don't answer right away. 2nd out of town funeral this month. Hoping February will be better. Back at work - minus 15 F. at 7:30 - great way to start off the year - if you are an ice racer ! Everything needs warming up before doing any work in the shop or garage. Even my dog, ( 110 lb. Chesapeake Bay Retriever ) who retrieves in the water until it freezes did not want to stay outside. Check here for parts updates over the next few weeks. This is the time of the year when we try to build up inventory on our custom made parts. Remember - a lot of our parts start out as raw steel or aluminum which is custom machined to our specifications us or other local shops. That's why it can take a while to re - stock when we run out. Its not a question of re-ordering, but of having more made. For many parts we plan only one or two production runs a year. But some of the big companies are not any better, we have had to wait almost 6 months ( and still counting ) for shocks from Bilstein, and these are the standard shocks, not our custom modifieds. Hoping everyone has a great holiday. We will closed the 21st - 28th, but will continue to take orders by email. If you would like to order an engine, this is the time. Between now and spring we get most of our engine building done, or at least plan to. 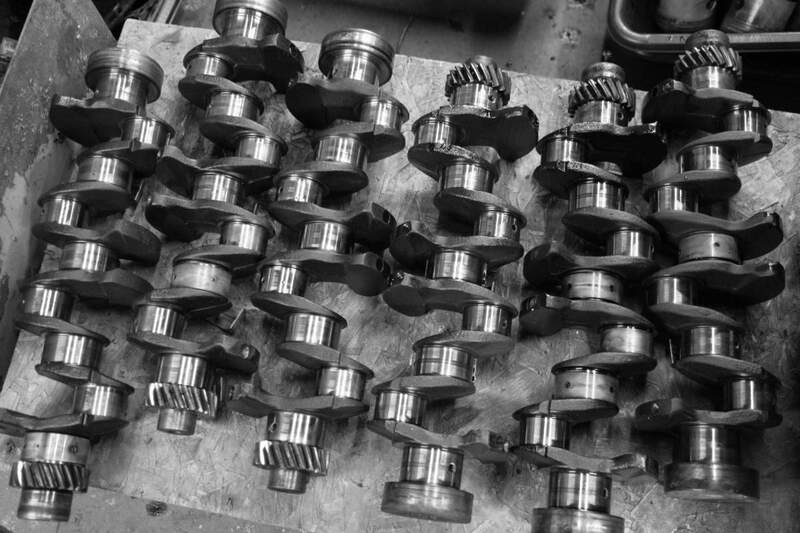 After the end of the summer and racing season, parts tend to be more readily available, the machine shops that we work with have more time to catch up, and custom made parts take less time from time of order to delivery. So let us know ASAP if you would a street or racing engine for next spring - before we have too many orders and too little time left. Also, expect price increases for orders placed in 2018. I'm out of town for the holiday, plus a few days the following week to work on a project, but still taking and shipping orders. Call forwarding is no longer being offered in our area by our phone company ( Verizon ), so if you need to get me by phone while I am out of town, or have left a message and did not get a response, try my cell 315 440 6560 and leave a messege with time and date of call and a return number. Our new Aluminum Valve Covers and SU type manifolds are now available. Click on the photos above and below for larger images. See details in the appropriate parts sections. Depending on the track of Hurricane Jose, I will be out of town for a few days this week. Call my cell, 315 440 6560, if you need to get in touch by phone and leave a message and return #. Otherwise I will be replying to emails and will post updates. I should be back by Thursday afternoon. Yes we are still here! Intermittent problems with the server that hosts this website have caused the site to be off line from time to time over the last several weeks. I did not realize it until customers emailed to ask - " are you still there ". If you find you can't access the site, send me any email as it could happen again.We should have some new products later in July. We are importing from Sweden headers for both the B18/B20 and B21/B23/B230. Several sizes of each are available based on the level of engine modification and type of use. The B18/B20 header is pictured above, and the B21/B23/B230 is below. See the "exhaust" section of our website for more details. These are good quality headers, designed for performance, and are the best alternative to our custom headers that are not currently available. The first batch of our new progressive rate springs arrived Thursday, with more due in next week. Most of these are our standard lowering height of 1.5 inches, with a few 2" lowering springs mixed in. We still need rears to match the 2" lower fronts. More of the lower springs, both fronts and rears should be in next month, including some that are 2.5" lower than stock. Right now, those are still in the sample stage. We also have some new parts coming in. New aluminum SU intake manifolds and cast black Valve covers are due in this summer. Progressive rate fronts springs were coiled this past week, in a choice of ride heights. They still have to be finished and powder coated by our spring supplier, which will take about a week, but it means we will definitely have springs in stock by the second week of May. Next will be more rear springs, to match up with the fronts designed to give 2" and 2.5" lower ride heights as compared to our standard 1.5" lower than stock height springs. At the same time, we will be stocking a new line of aluminum spring spacers. These will be discs that go on top of the springs and provides positive location based on a shoulder that fits inside the spring. These spacers will make it easier to make height adjustments where necessary. A batch of Bilstein rear shocks, re-valved to our custom specifications, was also finished last week, but was sold out in advance. Another batch is in the works, and hopefully Bilstein will be able fo finish these more quickly than the last batch, which was delayed when they moved their Cal. service dept. to another building. Polyurethane bushings for most models are also in stock, with more coming in over the next several weeks, so we will finally be back in position to supply complete, integrated suspension packages. The long wait for more of our custom made, progressive rate lowering springs appears to be over - finally. Our new line should begin arriving in early May, including, at customer request, new springs that are designed to give a much lower ride height than we have usually stocked. 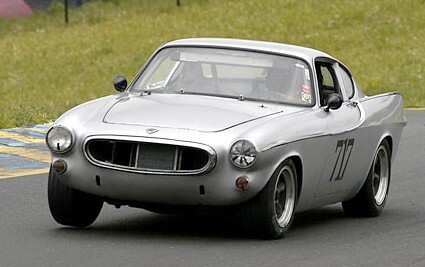 That will make us the only supplier of springs for older Volvos that offers a choice of ride heights. Bilstein rear shocks, with our custom valved rears are also on the way, and with any luck will be here at the same time as the springs.We also have our polyurethane bushings in stock, with more coming in, rounding out the suspension upgrade package. Spring? While there have been updates to other parts of the website, more photos, customer comments, prices, etc., I've skipped over doing regular " recent developments "reports. Not much to report during the winter months, but I don't want to give customers the idea that nothing is going on or that I went south for the winter. Winter is a time when we try to catch up on projects, and spend a lot of time in the shop grinding, machining and in general preparing parts needed to complete spring projects. In terms of spring, it has been illusive this year. Above is a photo taken 4/3 after we got another 6 inches. This update will be followed by another on parts availability. Just wanted to write and say thanks for my shocks and springs. I’ve just completed a tour of Europe and driven 3000 miles in 10 days and the car was an absolute joy to drive. Your springs and shocks are truly amazing and my P1800’s handling is transformed, but yet the ride is still so comfortable and the unbelievable handing is not at the expense of a harsh ride. On my holiday I was with a group of friends, one of which had a new 911 Turbo and two others who had new Ferrari’s, a 456 Special and an FF. All three drivers couldn’t believe how my little P1800 handled. Thanks for selling just a great product and for pulling all the stops out to get them to me quickly. The office will be closed until next Thursday 12/31. I will still be checking emails and processing orders, especially on Monday 12/28 and Wednesday 12/30, and a few items will be shipped before the 31st. Shipments of springs, shocks, carbs and distributors are due to come in next week. Some of these were expected to come in this week or earlier, to allow our shipping to out before Xmas, and the arrival delay has caused a delay in shipping to some customers. Email if you have any questions. Actually doing ours a week early in order to be with family who will not be available next week. So we are closed for the next couple of days ( though still checking emails ) and will be working next week. It looks like the actual Thanksgiving Week will be a good week to concentrate on getting head and engine work done. I will be out of town until Tuesday for a funeral. My mother died last week at age 98. Taking care of her has been my main priority for the past five months, and to a somewhat lesser extent for the past 3 years. Fortunately my wife and I were able to be with her for the past few months, and this allowed her to die at home with family as she wanted. During that time my wife stayed with her full time, made possible by the coincidence of her planned retirement occuring a few days after my mother's stroke in December. I had to decide on priorities and taking care of my mother during her last days became the top priority. I tried to go back and forth from Upstate New York to Long Island ( 370 miles each way ) when ever possible in order to try and keep up with orders and picking up parts to ship, though circumstances ended up limiting my trips back to a few days per month. Making it more difficult than anticipated were continued problems with home health aides, being snowed in, my wife breaking her leg while trying to help me rescue our dog when he fell through the ice, etc. It should not be a surprise that during the six weeks both my mother and wife were in wheel chairs I did not get much done other then take care of them. All of that appears to be behind us now, so starting next week ( 4/28 ) getting back to business and catching up as quickly as possible will be the prority. Some things will hopefully happen quickly once I am back at the shop, though its still going to take a few days to ship pending orders as they all can't be prepared for shipping at once. Other things, such as head and engine work will take longer since there is no way to hurry that kind of work and still do it right. Those tasks that can be handled quickly will be done first, and then I will tackle those that take more time such as the engine work. It will probably be another week before I can give a reasonable answer to the question, " when will my engine by finished? " Thanks for your words of support and patience. Working from another location today ( Tuesday 1/20 ), shipping and taking orders. Will be back in office in Syracuse on Wednesday. Back on a regular schedule, except that the office will be closed on Mondays instead of Fridays for the next few weeks. I will continue to take email orders 7 days a week. We have a good stock of most parts, with more coming in to be sure that we have enough for the spring rush. Order now as we tend to run out when everyone orders parts at once to get ready for spring events. Back for a few days and trying to catch up on shipping. And hoping that we can soon get back to close to normal if my mother's condition continues to improve. Fortunately most of the parts that we have been waiting for have come in or are due in the next few days. And hoping 2015 will be better than 2014. Things are slowly getting back closer to normal and I am spending a couple of days this week back in the office and shop trying to catch up on orders and shipping. (Unfortunately UPS's limited shipping schedule before New Years knocked out some of our shipping and receiving plans.) We have a good stock of springs and carb parts either here or on their way and so will just need time in the shop to get them shipped. Our regular phones are still out until Verizon swaps out the old copper lines to fiber optic scheduled for Monday. With considerable help and effort my mother came home from the hospital in time for Christmas. Despite all we were able to have a good Christmas Day together with family. I hope all of yours went at least as well. I plan to be back in the shop and office for a couple of days next week and will try to catch up on shipping and will do more the following week. Due to my mother's illness ( and getting sick myself ) I was not able to make it back to catch up on shipping this week ( Dec. 22 - 26 ). I will be out of town until December 29th when I plan to be back to catch up on shipping that was scheduled to go out before the holidays. Please email me if you have any questions. Our phone service is temporarliy out at the office ( thank Verizon ) so you may not be able to leave phone messages on our regular answering machine and we cannot retrieve messages that have already been left. My mother is in the hospital for the second time in the last few weeks, this time with a stroke that she is fortunately recovering from. Taking care of her is going to have to be my first priority for at least the next few days. I will try to continue to answer emails and take orders ( even from her hospital room) , but some shipments that were supposed to go out this week will be delayed until I get back. The good news for shipments is that rear suspension springs that we have been waiting for came in on Friday, and Mikuni jets that have been backordered since mid November are due in on Tuesday. With luck I will be back to get them shipped out. We will be closed for Thanksgiving - Wednesday - Sunday, at least that was the plan. In reality I had to leave town 2 days early in order to get my mother ( age 98 ) out of the hospital. If all goes well I should be back on Monday, but am continuing to take orders by email and arrange for some shipments while away. The other cars are there, and mine is always the last to go. Being painted as I write this and should there on Friday. Two sessions on Friday for group 3 - 9:15 and 1:50, one session on Sat. 2:25, and one on Sunday - 8:15. Our office is closed for the rest of this week and we will only be open Tuesday and part of Wednesday next week due to race commitments at Limerock and Watkins Glen the next two weekends. I will be responding to emails to take orders and answer questions, so please email rather than call. I hope to see many of you at the Glen Sept. 5 -7. We will continue to take orders by email and ship orders. Work will continue on engines and other products. Some of the Mikuni jets we have been waiting for since early May just came in, so though closed for the holiday weekend we will be doing shipping in order to catch up. Also taking orders by email on the 4th while waiting for "Arthur's" winds and rain to pass. Will be back to regular operations on Monday. See updated stock listing, current through today, below. 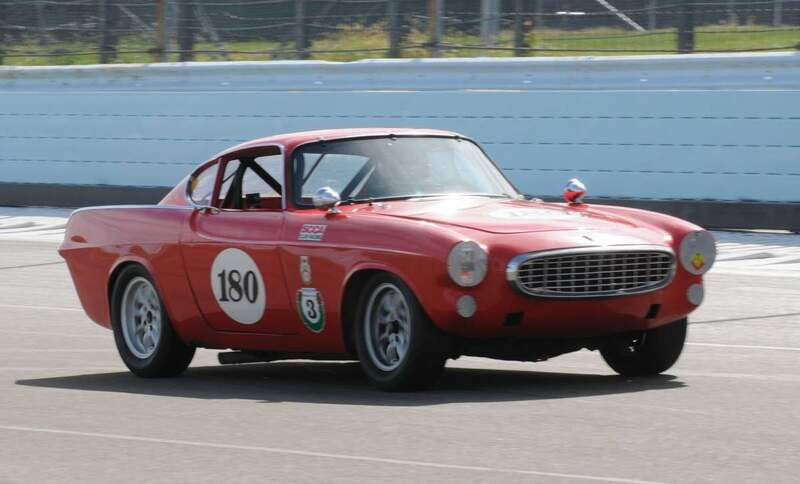 That's a Volvo 1800 winning its class and group at the SVRA Vintage and Historic races at Indianapolis Motor Speedway last weekend. After spending time with us for an engine rebuild and power boost this spring, the familar blue 1800, #68, now owned and driven by Volvo Trucks NA President Goran Nyberg, won its first time out after going through a few days of initial issues with the rebuilt, more powerfull, B20 2 L engine. Still using the head, crank, rods and pistons from its original build in 2001, by applying continued developments in porting, cam design, rocker ratios and carb tuning we were able to boost its peak power while at the sime time giving it a much broader power band - enough for it to win first time out over a field of 70 cars in its group - with a very good driver. To give you an idea of some of the work involved in coming up with the right combination of changes, we did 80 flow bench tests and 47 dyno test runs which included testing 2 different cam designs, two distributors, three different sets of rocker ratios, two different intake manifolds, two carb sizes, several different main venturi sizes, and many different jet combinations. We will be closing early next week for a long weekend that will include a car delivery, a parts pickup, and home visits to several 1800s that need our assistance. Pushing hard to get spring projects completed and will not have time to spend on the phone, so please email if you need to get in touch with us I and I will try to reply within 24 hours. If I were to stop work to answer the phone every time it rings, nothing would get done and it could be your project that gets interrupted. This week, 4/28 - 5/1, I will be at one of the garages most of the day and out of town 5/2 - 5/4. 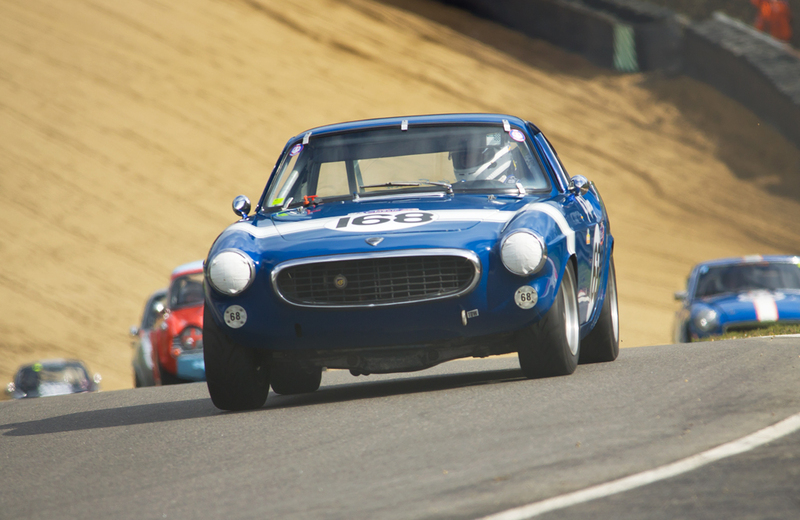 Back from a year of racing in the UK, pictured below at Brands Hatch, is the 1800 vintage race car that we built and first raced in 2001. Now on its fourth owner, Goran Nyberg, the President of North American Sales & Marketing for Volvo Trucks, its back in our shop for a refresh and tuneup. Still running basically the same engine from 2001, its a testament to the reliability of these engines when properly built, even when highly stressed. Check out the link below for a video of it racing at Donnington Park in the UK in 2012. Below is the most recent updated listing of our most popular parts. Please note that of the parts listed over half are either custom made or custom modified by us or for us. When we run out we can't just get more from a wharehouse, they have to be made. Progressive lowering spring sets 1800/122/140 - Most fronts in stock and rears available until more rears in stock - order now as they sell out quickly. More 140 rears available. Currently out of the 1800/122/140 front progressives designed to give a really low ride - 2.5 inch lower than stock - those should be available again soon. Polyurethane Suspension bushings - More coming in next week. Mikuni Carb Kits - Single, Dual and Triple Kits - Selling out as soon we can get the carbs and parts in. Shipping for most kits running about 2 - 3 weeks from time of order, with most parts currently available. Most jets needed are now in stock, except for pilot jets which should be coming in this week. 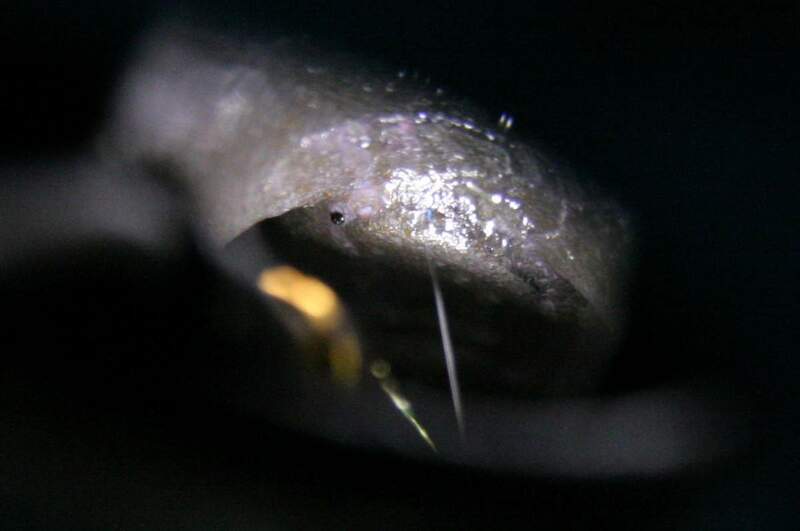 The needle jets we use for most kits and were back ordered with Mikuni come in, though still in limited quantities. B20 4-2-1 Headers -- ceramic coated headers with our exclusive merge collector - our last batch is sold out. Currenly taking orders for the next batch due August/Sept. 2014. These may be all Stainless Steel unless customers request ceramic coated. Let us know in advance which type you want. Performance Camshafts - some in stock but supply is tight until new cam cores are available. Valves - High flow 36, 38, 40, 42, 44, 46 and 48 mm intakes and exhausts in stock - including the 36 mm exhaust valves we were out of earlier in the year. Bronze Valve Guides - good stock - we now have some of the guides needed to convert B18 heads to B20 valves. Aluminum Race Flywheels - available by special order only - order now for next race season. We may not be making any more of these unless we receive several orders for next season. We need B20 core engines, B20F heads, and B20 bell housings. If you have any and would would like cash or a trade for any of our parts, please let me know. Plans to catch up on shipping this week are being disrupted by storm delays. 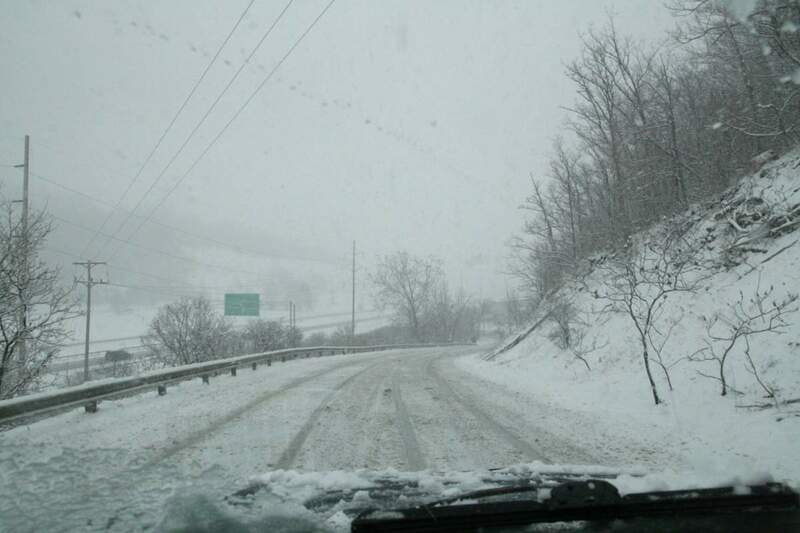 We have suspension springs and carb parts that were supposed to be here today ( 3/13 ) that are currently shown on UPS tracking as - "Severe weather conditions have delayed delivery" with no updates available at this time. Hoping they will be here tomorrow in time to get shipments that were waiting on those parts out this week. As part of the concentration on shipping, some email responses may be delayed as I cannot do both at the same time and will have to catch up on emails over the weekend. And for those in parts of the US where it looks like spring may be arriving soon - here it was 7 deg. F this morning with more than a foot of snow in the past 24 hours. Medical issues are hopefully over. My wife is back home and recovering. I am finally getting back in the shop on a regular basis, though I am still tired don't have medical clearance to do lift anything yet. Thanks for all of the concerned emails I have received and for your understanding of the reason for delayed shipping, etc. I am still trying to return emails and telephone calls that I may have missed in the last couple of weeks. If I did not return yours send another. There are stacks of parts here for orders that need to be shipped and hopefully these will all go out this week. We look forward to getting back to normal in March. Now its my wife who is in the hopital. I was recovering nicely from my surgery and had planned for this to be my first week back on a regular, though limited schedule. Then my wife got sick and had to go into the hospital on an emergency basis early Wednesday morning and had surgery on Thursday. She is now recovering - 3 rooms down from where I was 3 weeks ago. I will have to continue focusing on her for the next couple of days so it may be hard to get hold of me. Please send emails and I will try to catch up by the end of the weekend. Some shipping will go out Friday, but most will be delayed until next week. Unfortunately I ended up spending more time in the hospital last week than expected, so my estimate of delays were also off. To make matters worse a computer virus put our main computer out of action a couple of days before I went in, preventing some shipments and notifications from going out that were scheduled to be sent out prior to my operation. In fact the computer ended up being in the "computer hospital" at the same time I was in the real one. Finally got it running again on Monday night. Recovery is taking a little more time than expected, and I am more tired than expected. I will try to answer all emails and phone calls from the last 2 weeks in the next few days. Shipments will start going out before the end of the week. Thank you for your patience. Our office will be closed during the above period of time for medical reasons. I will be in the hospital for an operation for couple of days. Please try not to call during this time period. We will be taking new orders and inquiries by email and I will try to respond to all inquiries by the weekend though hours may be limited. Others will continue to work on various projects during this time period, but shipping of orders may be delayed until the following week. And has turned out that my estimate above was overly optimistic in terms of recovery time and shipping delays. Working on the 2014 race schedule. Not to mention the work needed on my car. Progressive lowering spring sets 1800/122/140 - fronts and rears in stock in the most popular ride heights, including new springs designed to lower the 1800/122 less than our standard lowering springs - order now as they sell out quickly. More 140 rears available in about a week. Polyurethane Suspension bushings - In Stock. Mikuni Carb Kits - Single, Dual and Triple Kits - Selling out as soon we can get them in, shipping for most kits running about 2 weeks from time of order, with most parts currently available. Most jets are now in stock. 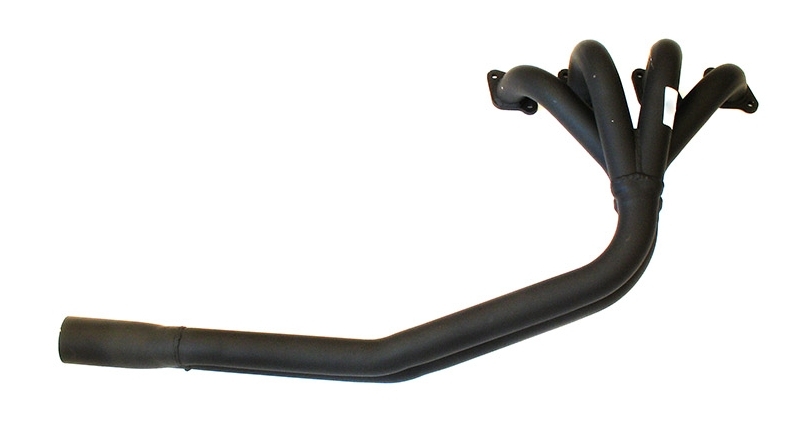 B20 4-2-1 Headers -- ceramic coated headers with our exclusive merge collector - our last batch is sold out. Currenly taking orders for the next batch due in February 2014. These may be all Stainless Steel. Let us know in advance if you want one. Valves - High flow 36, 38, 40, 42, 44, 46 and 48 mm intakes and exhausts in stock - including the 36 mm exhaust valves we have been waiting for since November. 123 Distributors - carb type for Volvo B18/B20 - more coming in late February. There is now another Mikuni Kit for MGs, but not with the same carbs, among many other differences. The Moss Motors kit uses Mikuni carbs, but not the 42 mm HSR Mikuni carbs used in our kits. Their carbs are smaller 36 mm carbs of a different design not as well suited to automotive applications. The single carb cost of the carbs they use is less than our Mikuni HSR series carbs, yet their kit is priced at $350 more. 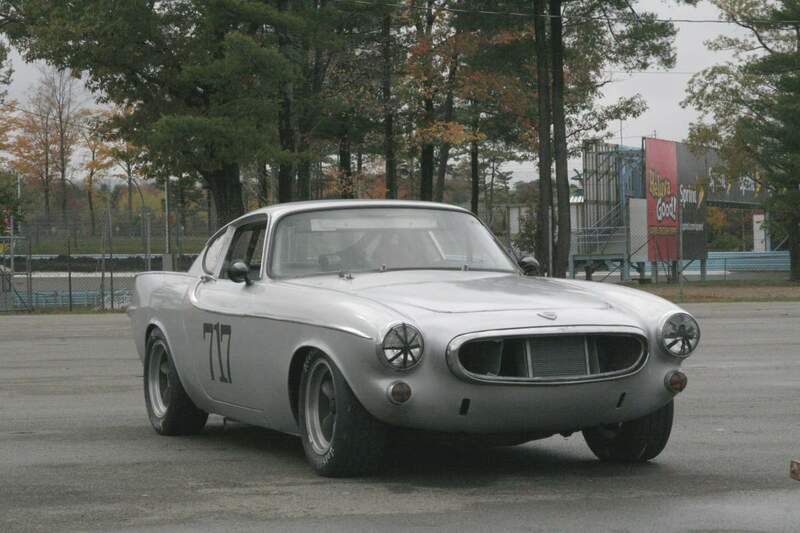 Ours are proven kits, marketed for over 8 years, with exceptionally positive reviews from owners not only of MGs, but also almost every sports car and sports sedan that originally was equiped with either SU or ZS carbs - from Alpine to Volvo. Our kits are backed up by years of road and dyno testing. 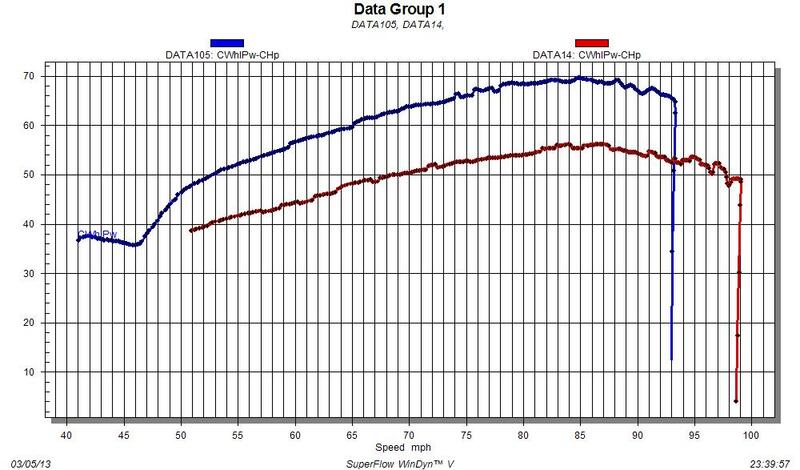 The dynomometer test results below document the improvements in performance with our carb kits on MGBs. We will also be posting a photo installation guide for the MGB. 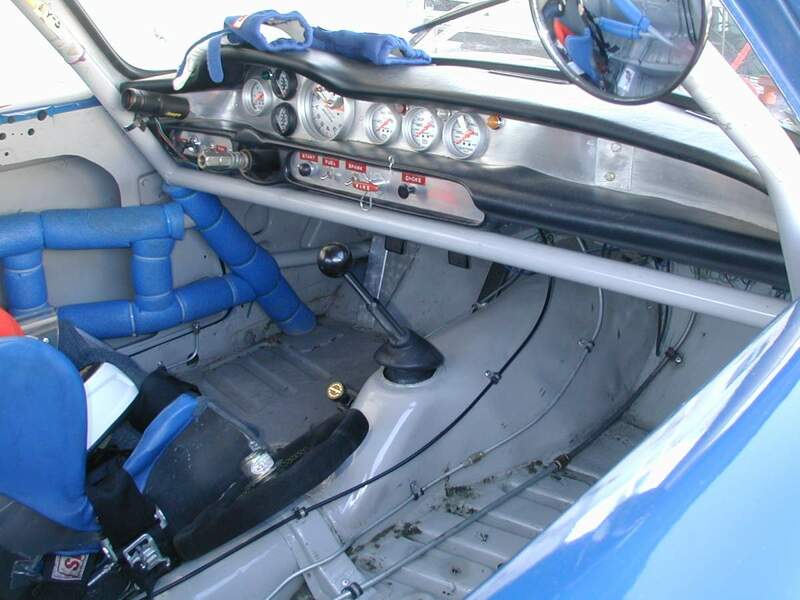 The chassis dyno comparison below is between a stock MGB with SU carbs and the same car with our Mikuni HSR carbs. The horsepower scale is on the left, recorded as corrected horsepower at the wheels. Vehicle speed is on the bottom. The tests were conducted in 4th gear. 50 mph is 3000 rpm. 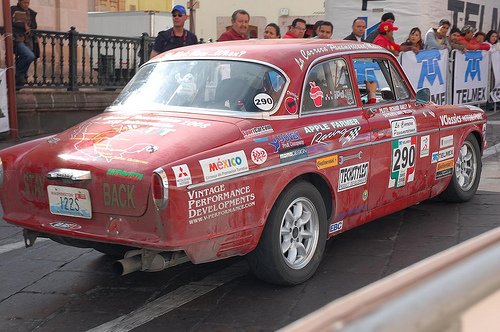 The red line is corrected wheel horsepower of the stock MGB with stock SU carbs. 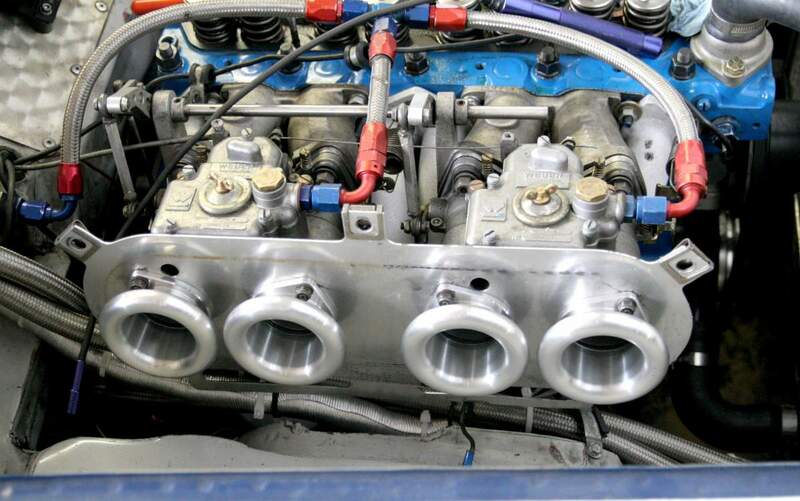 After testing with the stock setup, we installed our Dual Mikuni Carb Kit with 42 mm HSR carbs. The black spacers, heat shield openings, and intake manifold openings were slightly enlarged to match the size of the 42 mm carbs, tapering from larger to smaller toward the engine. No other changes to the carb or engine were made. We were surprised by an increase of 13 HP, approx 22 %. What can't be shown is how much more fun to drive the car was, with instant throttle response that kicked the car forward when you hit the gas. Note that there is no loss of low end power. The dyno chart below shows the same comparison as above with another test added. On this chart the green line is the stock engine with stock SU carbs. The red line is the same stock engine with dual Mikuni 42mm HSR carbs. The top blue line is from another test session. 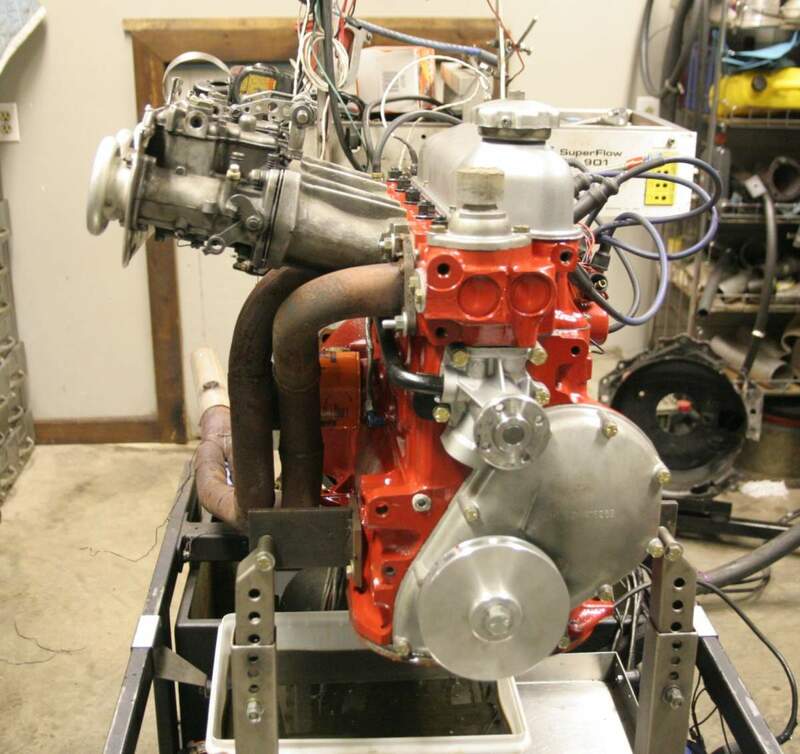 This was a dyno test , on the same chassis dyno under similar conditions, of a 1979 MGB with modified engine, header and high flow exhaust, ported head and "fast road cam", along with the same 42 mm Mikuni HSR carbs, showing the true potential of this setup. All figures are in corrected horsepower at the wheels. 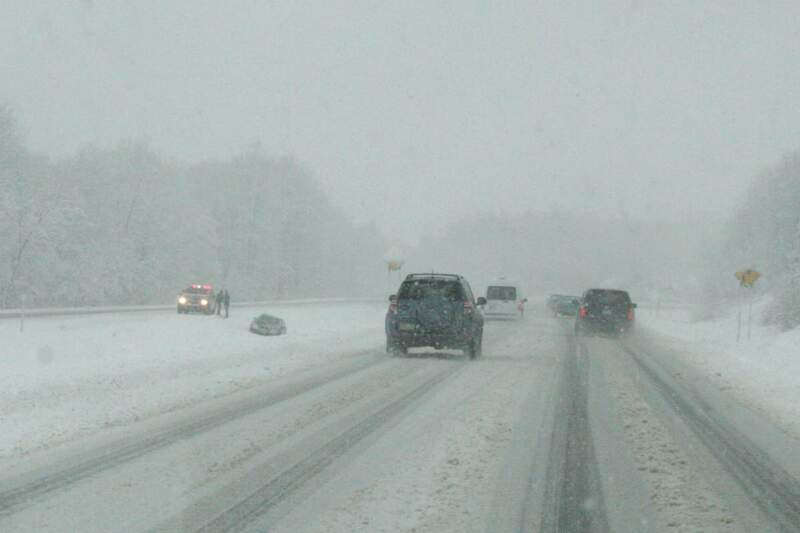 Again stuck on Long Island for a few days by a storm. This time digging out from a snow and ice storm that closed most of the roads. And again without an internet connection until today. Catching up on emails and back in the office/shop on 2/13. Verizon has verified that its a problem with their cable and has agreed to expedite service by sending someone out to fix it by Feb. 4th! Until that happens, please correspond by email whenever possible. We will be updating this listing of our most popular parts on a weekly basis. Please note that of the parts listed over half are either custom made or custom modified by us or for us. When we run out we can't just get more from a wharehouse, they have to be made. Prices are going up for 2013 on some items due to increases in our costs. If you order before the price increases are listed on the website we will honor the 2012 price. Below is an updated ( 2/15/13 ) stock status listing of some of our most popular items. Mikuni Carb Kits - Single, Dual and Triple Kits - Selling out before we can get them in, shipping for most kits running about 2 weeks from time of order, with all parts currently available, Quad Kits delayed waiting for parts used only in those kits. B20 4-2-1 Headers -- a new batch of ceramic coated headers with our exclusive merge collector are now being coated and will be available in about a week + one in stainless steel - let us know ASAP if you are going to want one. This is the only batch of headers that we will have until more are made next fall. ARP Rod Bolts - for B18/B20 with 6 bolt crank - our February shipment has sold out. More due in March. I will be answering emails later next week after I finish working exclusively for my wife for the next few days. And hoping there will not be any more storms, etc. This weekend trying to get our well on Long Island working again that was polluted by the storm surge. That will not be finished until Tuesday, so I will not be backin the office until late Tuesday. The power came back on at 5:30 Sunday afternoon and I left a couple of hours later arriving back here at 3:00 AM. Had to make further preparations for this week's possible Nor'easter before I left. We still can't use our well for water. The waves came within a few feet of it and the water turned yellow. Its supposed to be tested this week. Until then we have a hose going across the street to our neighbor's house and hope it does not freeze tonight. Used 40 gallons of fuel for the generator ( and felt guilty when we had one and so many other people don't ) , but keeping it running can get realatively difficult when the lines are 100 cars long at the gas stations - when you can find one with gas - and then after waiting hours find that they are limiting purchases to $50 per car. Filled up my truck ( 40 gallons ) and four 5 gallon cans before the storm, so was able to make it through with only one long gas station wait, with enough gas left to leave 10 gallons just in case ( Noreaster this week ) and get back to PA before having to fill up the truck again. Will post some photos when I get time. 11/1 - I am still on Long Island due to Hurricane Sandy. We lucked out when the wind shifted with the waves less than 50 ft from the house and another high tide coming. The power is out and I may be gone until it comes back on. Hopefully I will be able to post updates here and receive and send emails. Engine work at the shop will continue while I am gone. I have heads with me so at least in theory I can continue head porting as long as the generator keeps going and I can find enough gas for it. Lines at gas stations are 40 - 50 cars long today. I can siphon gas from the 45 gallon tank in the truck if necessary, but want to save enough to be able to drive the 350 miles back to Syracuse without having to stop for gas. Will try to do another update tomorrow and include photos. Catching up on emails now, but could have missed some that were not saved, so if you have not gotten a response to a recent email, please resend. Due to a flood of political calls, I will not be answering 800# calls until after the elections, unless caller ID shows it to be a customer. If I do not pickup leave a message and I will try to call you back. Mikuni - SU dyno comparison. 1974 MGB, stock engine - 22% increase in power with no change other than swapping the SU Carbs for a pair of 42 mm HSR mikunis. Makes a world of difference in the way the car performs. I did not believe we would get that much improvement by just changing the carbs. What is hard to describe is how much crisper the throttle response is and how the car just seems to want to go faster. 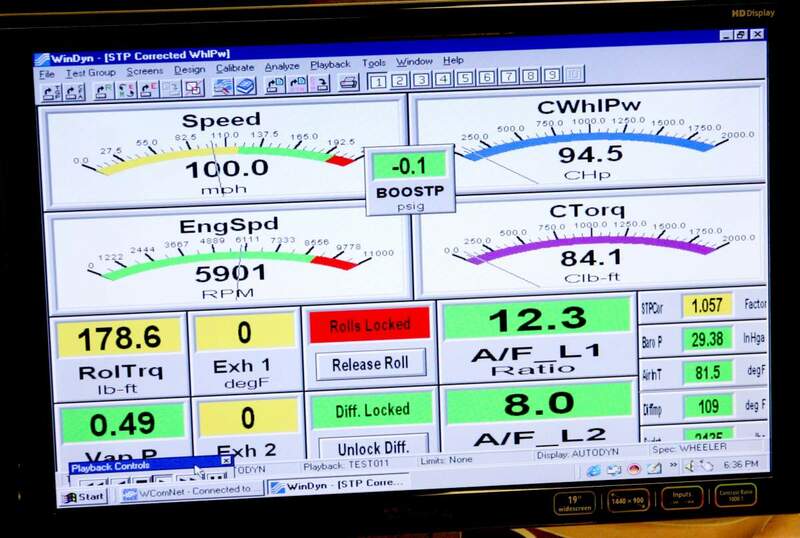 We don't have any fuel mileage numbers yet, but previous tests have shown improvements in fuel mileage as well as HP. We did have to open up the intake manifold opening to match the size of the Mikuni carb, but other than that there were absolutely no other changes - same fuel, same plugs, same timing, same valve adjustment - none of that was touched to be sure that we had a good comparison. We are back to our usual fall schedule - the office is closed on most Fridays and we are usually out of town every other weekend. Working here in the shop through one weekend, then gone the next for a few days. October dates are posted above. On some Fridays and weekends we are out of town, testing, racing, etc., but on others not answering the phone or doing emails just lets us get more work done. Also trying to limit the time for phone calls as we can't catch up in the shop if we spend the day on the phone. Emails preferred, but if you have to call please call between 10:30 and 12:30 AM EDT, Monday thru Thursday and leave a message if we do not pick up right away - we are probably in the shop. Send an email instead of calling if you can. Be patient if we don't always answer your emails the same day, it usually means we are busy getting a car project finished and out the door. See the previous update on this below for details. The update below turned out to be a good bit optimistic, as my time out of town continued after the 19th with 3 more trips and averaging 2 - 3 days back here in between through last weekend rather than the 4 days a week predicted. But I am now, finally, really back as of this past week and will be for an extended period of time and spending it catching up. Fortunately, work on engines and some other projects continued while I was gone, and we have started to get shipping moving again - facilitated by the arrival of some of the Mikuni Carbs, Headers, and Susp. Springs we have been waiting for. While catching up, I will have to limit telephone and email time, as they take away from the time needed in the shop and garage to get projects finished. A thought about all of this. I regret the delays that my not being here may have caused to various customer projects. However, I do not in any way regret spending the time needed to assure that things went as well as possible for my mother. To me there was no other choice. Their were days that could have been the last and I would have always regreted not being there. I learned that when my father died several years ago. Most of our customers have been very understanding stating - " You have to put your family and their health first, my project can wait." And for those, now that I am back, I will be doing everything possible to get their projects back on track. Other customers have not been so understanding, saying its a business and family health issues are no excuse. For those I can only say that they should feel free to take their business elsewhere. My mother ( 95 ) has been in the hospital, and I have been out of town with her. Nick Julian, who does a lot of our engine and project work at the garage, is recovering from a knee re-replacement operation which he had the day after my mother's operation. ( Great timing !). I am catching up slowly on all of the emails that have come in and have been back for a couple of days to do some shipping and coordinate work on various projects. Engine machining and preparation has proceeded while I was gone. I have been able to fit in some parts and engine core pickups on my trips back and forth and we will have a bunch of engines ready to finish once I am back on a regular basis. As of 3/19 I am back on a schedule of Mon - Thurs in the shop and office, while doing additional work while out of town over the weekend. Nick is back part time doing light work and will be back full time later this month. Thanks in advance for your patience. Mikuni raised their prices on March 1st. Unfortunately we had to raise our prices a similar amount - $25 per carb. If you contacted us about placing a Mikuni Carb order before March 1st, we will honor the previous prices as long as the order is placed and paid by the end of March. If you have any that you would like to get rid of, preferably in driving distance in the Northeast US please let me know. Cash paid at time of pickup. Pickups at a distance only make economic sense if we can pick up several engines and/or heads in the same geographical area at a time. The heads that we need are B20 F heads and we need 10 - 12. They can be shipped UPS, etc, in a well packed cardboard box. The usual price paid is $100 per head plus reasonable shipping. We can use any B20 engine. It does not have to be in running condition, but does need to be in good enough shape that the cranks, rods, and pistons will rotate - we have gotten too many engines that sat with water in the them that we could not use because of badly rusted cylinders. 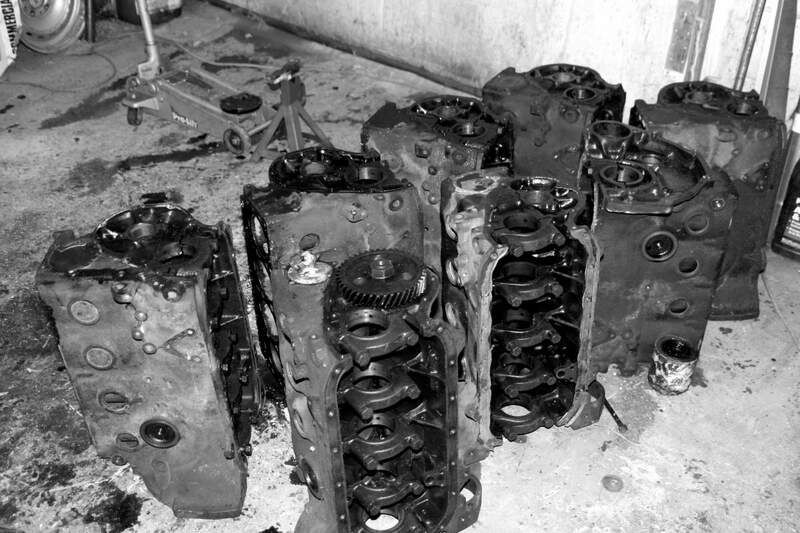 We need 5 - 6 engine cores to replace the ones that we have that did not pass inspection and testing. $200 - $400 depending on condition and which B20 engine it is. Out of town for a few days to visit my mother who has been in the hospital. Should be back on Tuesday. This was not planned so some shipping may be delayed. Will catch up next week. A computer virus knocked us out for a a few days this week, and is still causing a disruption in terms of the time it is taking to restore all programs. Luckily no data was lost, though it was not accessible for a couple of days, including emails - delaying all shipments scheduled for this week. We will be closed from Dec. 22nd thru Jan 2nd. 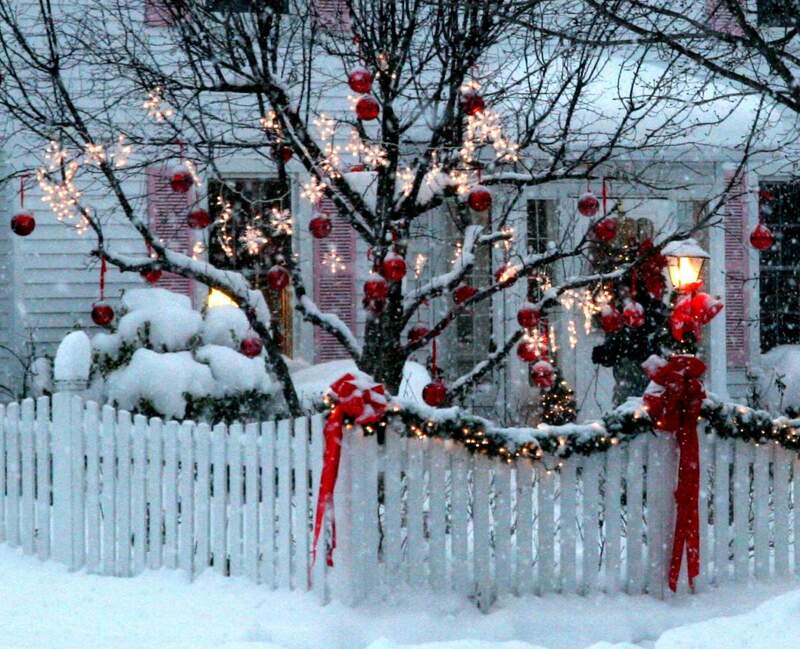 Have a great Xmas and New Year. 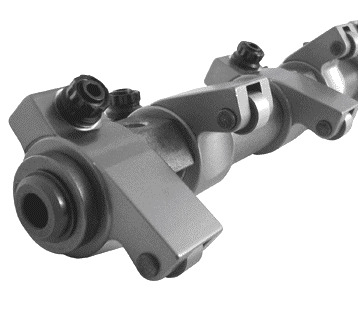 The Roller Rocker Arms expected in late Nov. are finally here. We will have more Exhaust Headers in January. Order now to be sure to reserve a set as they will not last long. 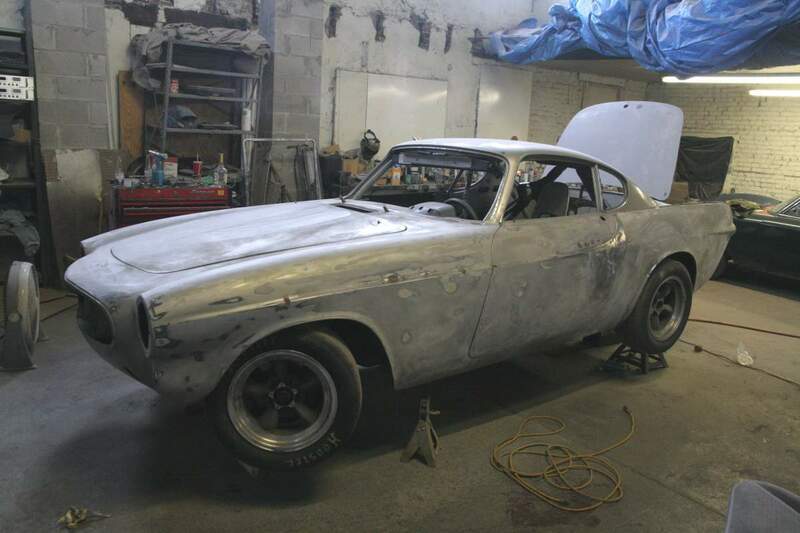 Another 1 - 2 finsh for Vintage Performance cars. I finished 1st, Steve Grabsky was 2nd in a 122 we built and prepped for the race. 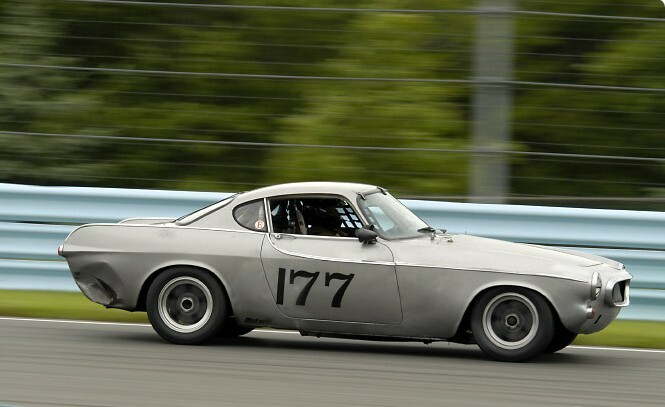 13 Volvo racecars made it to event at the historic Watkins Glen track - a much smaller turnout than our last Volvo event there in 2001, probably due at least in part to the later time of the year and weather concerns. More info plus photos to follow in the gallery section. All in all, it was exciting to again be racing with and against a bunch of old Volvos, but dissapointing that more did not show up. There really should have been 25 - 30 cars for a good showing. It was perhaps equally dissapointing that those there were not more competitive. 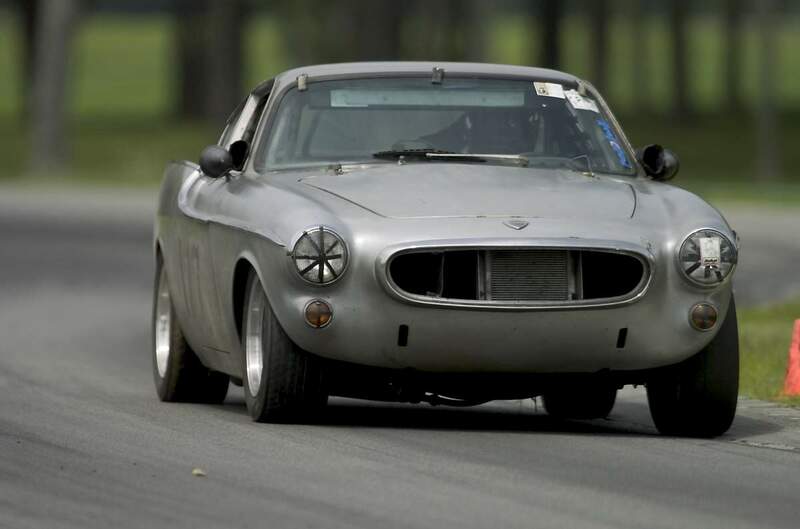 Except in the rain where Ian Lok of Canada was the star, my only competition was the 122 of Steve Grabsky, a car we built several years ago and prepped for this race. Steve and I had some tight racing and a good deal of fun. 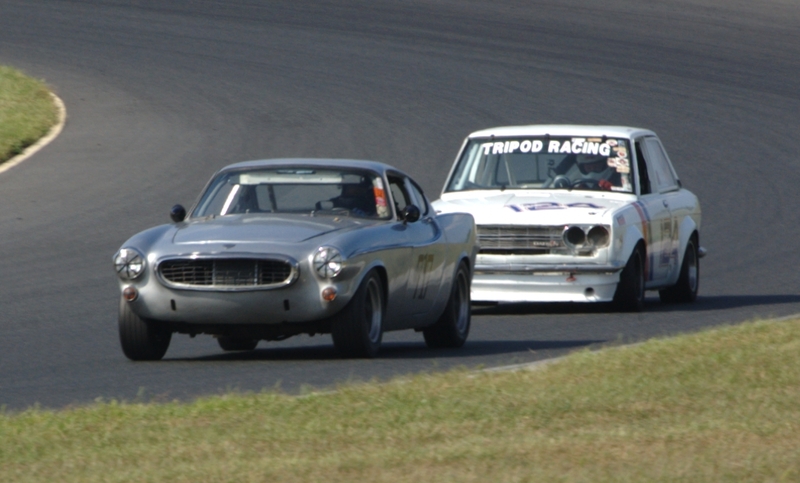 In the all Volvo feature race on Sunday he was right with me for several laps, we passed back and forth a couple of times, and we even went up through the esses side by side until I was able to pull away to a comfortable finish. 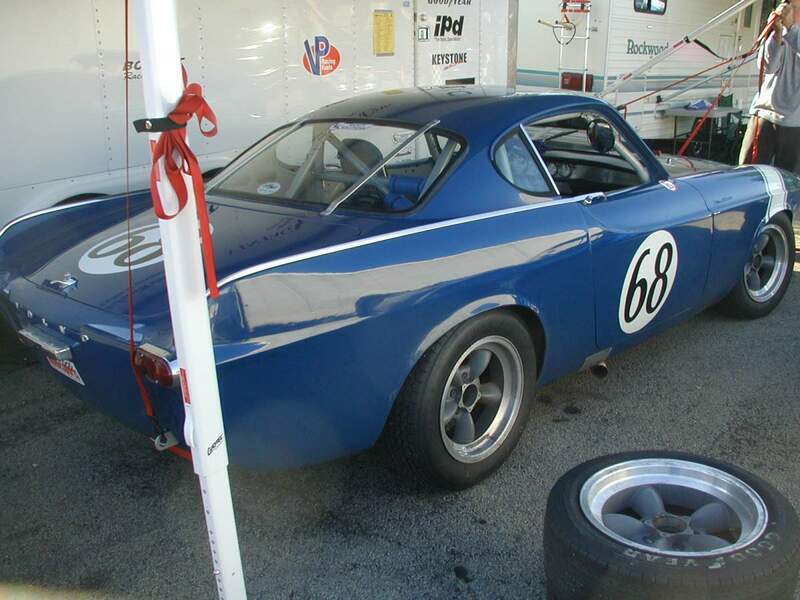 On Thursday night and Friday morning when all the other Volvos were already at the track I was still back at the garage finishing up body and paint repairs along with necessary pre-race maintenance work on the brakes and suspension. Those tasks finished I started the engine for the first time in over a year before loading it on the trailer. We got to the track Friday afternoon in time to go through tech and take a few laps in the rain in the afternoon practice session. 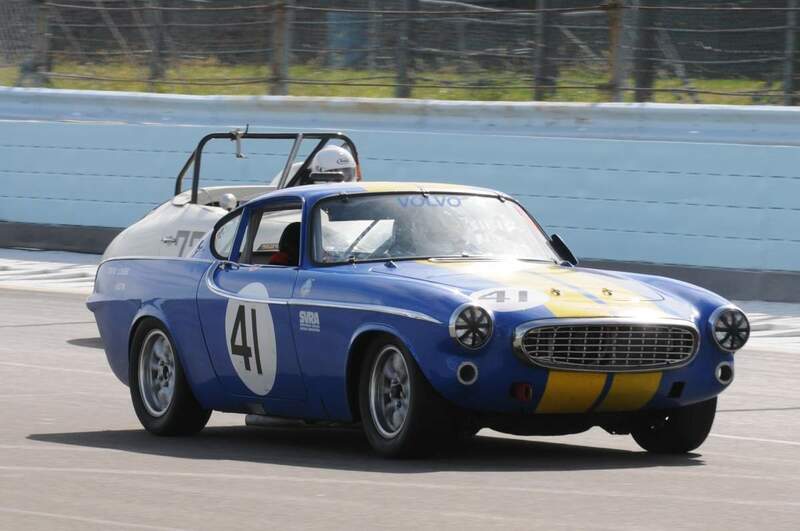 The next morning, in the qualifying race and first dry track session in over a year, we were 2 seconds faster than the next fastest Volvo, Steve's 122, and set the fastest Volvo time of the event by the same margin. 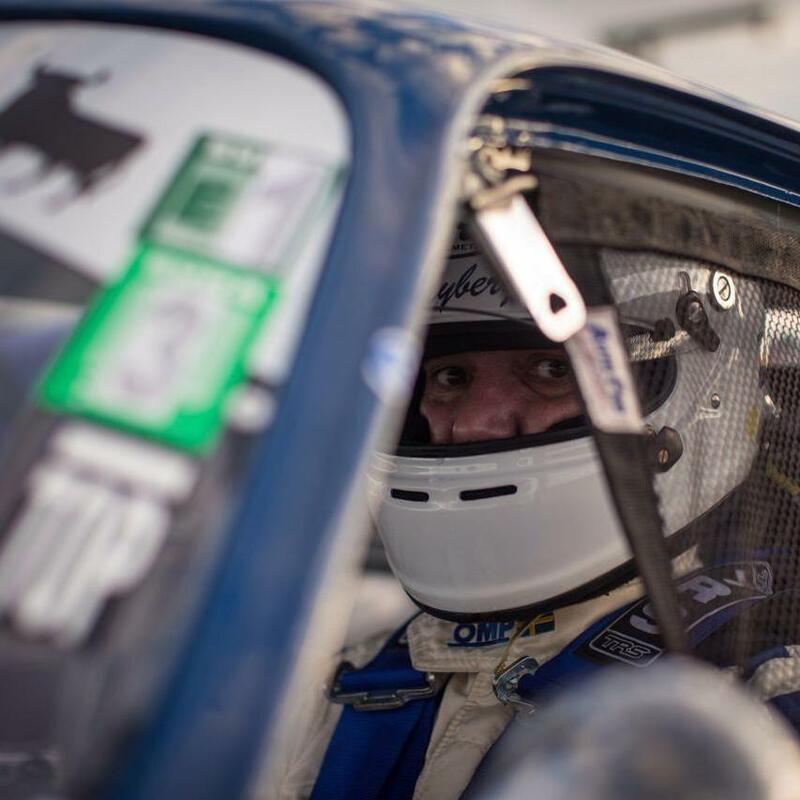 Steve and I ran the whole weekend without any problems - running just as fast and reliably at the end of the last race on Sunday afternoon as at the beginning of the weekend. 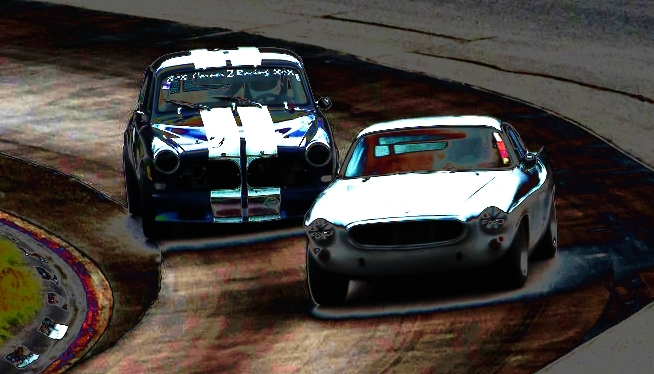 We finished 2nd and 3rd in the final Group 3 race, behind a Jag XKE - though I had the fastest time of the race and thought I could have caught him in a few more laps. Unfortunately there was only one other Volvo still there and running by the end of the Sunday afternoon race. These results say more than words can about how we build engines and prep racecars. Now for sale for $22,000 after several years of enjoyment by its current owner! 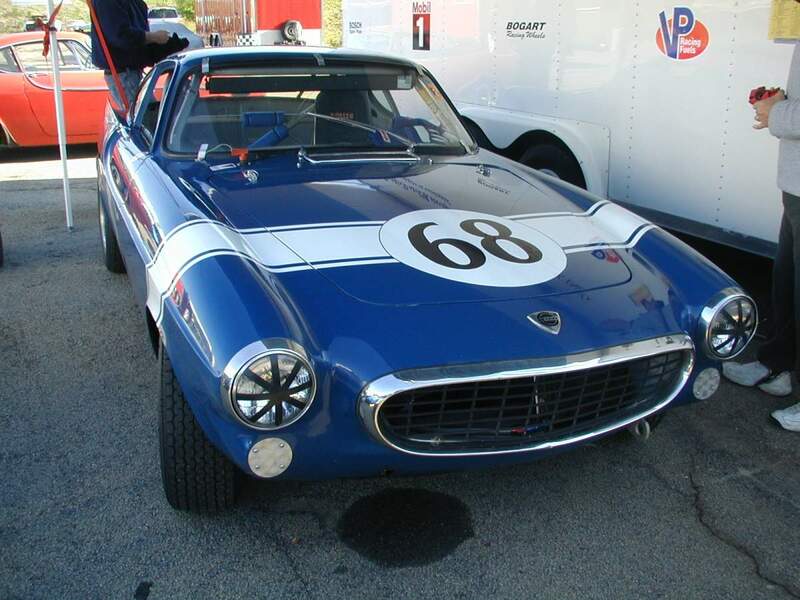 This car is a good example of the vintage racecars that we have built. now for sale again after 10 years of successful racing. 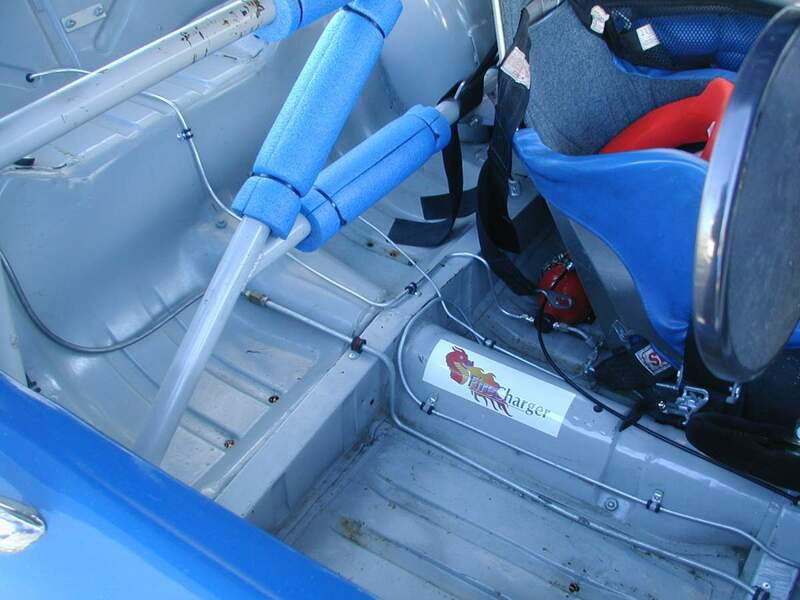 Its setup and equipment are typical of our vintage racecars. Nick Julian did a beautiful job on the body as shown in the photos. The engine is our 2 liter vintage race engine, rebuilt in 2010, equiped with dual Weber 45 DCOE carbs, forged pistons, BHP cam, Crower rods, baffled oil pan, ported race head, 13 to 1 compression ratio, dynoed at over 200 HP. The suspension includes Carrera adjustable shocks, race springs and adjustable front sway bar. 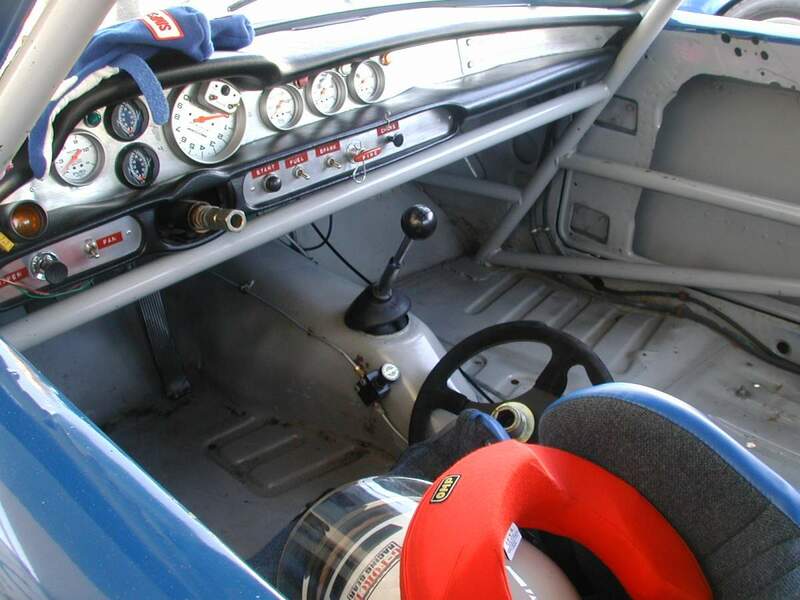 The car has 4 wheel discs brakes, Tilton brake cylinders with adjustable bias, aluminum flywheel, Tilton 7-1/4 inch clutch, T9 transmission with Quaife close ratio gears, fire system, a full set of gauges including exhaust gas temp gauges reading each cylinder, etc. Sold and shipped to the UK !!!! We will miss it. $22,000 for the car with spares. $27,500 for the car and a very nice enclose trailer. This is an excellant value for a complete, turnkey, ready to race package that could be delivered to the track ready to go. Let me know if you would like more information. We finally got back Wednesday night and have been trying to catch up since. Made more difficult as I managed to hurt my back in the effort to move things in preparation for the hurricane - probably when I tried to pick up the tongue of a heavy dual axle trailer. We will be closed for the long Labor Day Weekend and hopefully back at full strength on Tuesday, though cancelling personal participation in races at Watkins Glen the next two weekends. I am still on Long Island due to Irene, which may have been a bust in terms of being a powerful high wind hurricane, but it was enough to knock out power in large areas, 500,000 homes on Long Island alone, and our whole village has been out since Sunday morning. Running off a generator, but I may be stuck here as I can't leave my mother until the power comes back on and things are more normal. Then there will be the question which roads are open and leaving won't do me any good if the roads are closed. 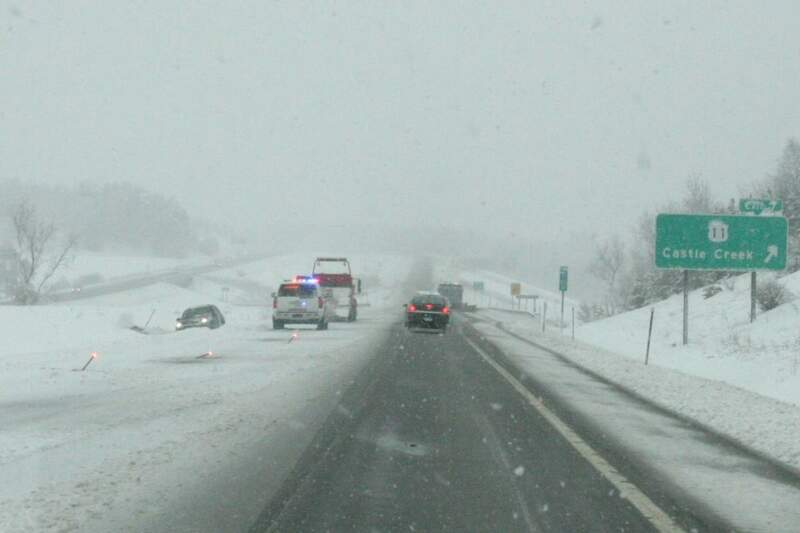 ( NY State Thruway closed from Albany to Syracuse). I will post an update here once I know more. 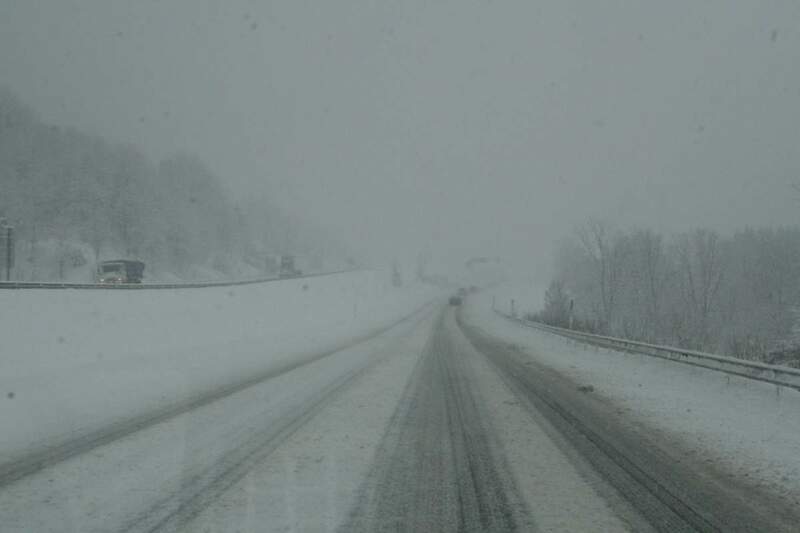 Back upstate work is still progressing at the shop, but some of the crew will be leaving for the Lime Rock Vintage Festival on Thursday - assuming it has not been canceled due to conditions there ( half of CT was reported to be without power ) . Hopefully I will be back by then. Plans to close the office for a few days, get some uninterupted work done, and then take a couple of days off have changed. Now the only plan is to prepare for Irene. I'm currently at our family home on Long Island ( NY ), less than 100 feet from the water, and will ride out the storm there with my mother ( just turned 95 ) and other family members. When I get back will depend on Irene. Some planned shipments may be delayed, though other members of our team are still at work on your projects. I will post updates and maybe a few photos once the storm hits. The office will be closed from Tues. the 24th thru Mon. the 30th. Work will still proceed on projects, including some shipping, but we will not be taking emails and telephone calls in the office during that period. On Tuesday will be testing a 122 at Watkins Glen. The office is going to be closed this coming Monday and Tuesday, as I will be out of town - Monday for my mother's 95th birthday, and Tuesday to pickup more heads and engine blocks. We currently have a good stock of blocks, but are short on those that test out with thick enough cylinder walls for the engines with 92 and 93 mm overbores. Closing early for the July 4th weekend. We will be working on projects on Wed and doing some shipping on Thurs, and Fri, but the office will be closed Wed thru Mon. Promised my wife I would finish a non car project by this weekend and she's holding me to it. Back on the 5th. Have a great holiday. We are currently in the testing stage of one of our new roller rocker systems for the Volvo B18/B20. There are several further options being considered and customer input will help us make decisions on the system or configurations to be offered. Right now, 2 basic systems are being considered, with each having at least a couple of options. Either system will have the main advantage of replacing the stock rockers, which even when new were a mixed bag of ratios none of which met the factory spec of 1.52 to 1, with precision made roller rockers that will provide equal ratios and valve lift for each cylinder, and will reduce wear and stress in the valve train. 1) System I - 1.53 to one ratio aluminum roller rockers, with bronze bearings, designed to work on the stock shaft with stock shaft pedastals, stock type pushrods, using the stock adjusters. Advantages of this system are low price, ease of installation, no need to enlarge the pushrod holes in the head, and the ability to provide a significant increase in performance. A higher ratio version of this system could also be available that would require enlarging the pushrod holes in the head, requiring removal of the head. Expected selling price would be in the $400 range and it should be an excellant replacement for stock rockers in most street and high performance applications. 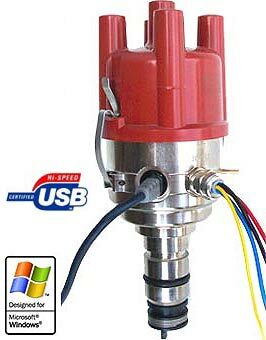 This would also be one of those rare performance products that can actually be installed in a couple of hours and will give a significant improvement in performance. Most stock rockers that we have tested have ratios of 1.47 or less. Comparing the lift with a 1.53 ratio rocker - with the stock 1.47 ratio rocker the valve lift at .300 cam lift would be .441 vs .459 for the 1.53 ratio rocker, which may not sound like much difference but is very significant in terms of effective cam duration. 2) System II - This is a slightly more complicated system, designed for higher ratios in performance and race applications. It will use aluminum roller rockers, needle bearings, will have its own rocker shaft and pedastals, require enlargement of the pushrod holes in the head and new pushrods, and have a price that will be approximately double that of System I, above. This system would be recommended for the serious high performance and race customer and ratios will likely be in the 1.6 t0 1.65 range. Your input on whether we should offer one or both of the systems described above will help us make a decision and facilitate the return of roller rocker systems to our product line. The next step will be customer assistance in beta testing of the systems. Those interested in participating will be offered a roller rocker system at a considerable discount in exchange for their feedback and help in fine tuning the system. Both systems mentioned above will require either a modified stock valve cover or an aluminum valve cover. And for those of you with other makes of car, we expect to be offering non - Volvo roller rocker kits as well. Back on Tuesday with a trailer load of B20 core engines needed for our engine building program. Test samples of our new roller rockers are here for testing. In 2009 a decision was made to discontinue our roller rocker kit and instead concentrate on improving results with stock rockers. At the time we felt the kit needed improvement and some of the components used were becoming unavailable. Since then we have been looking to introduce a new version of the kit, have spent considerable time investigating options, and are in the final stages of development. After a period of testing, the new RR kit will soon be available. It will use the stock rocker shaft, shaft pedestals, and pushrods and will be available in stock as well has high lift ratios. If you are interested in this kit, send us an email so that we can put you on a list to recieve updated information on price and availability. This will also help us determine how many of components need to be ordered to fill 2011 customer orders. Advantages of the new kit will be similar to those of the old kit, plus it will be easier to install, more reliable and less expensive. Increases valve lift and effective duration. Reduces valve train wear and increases the life of valve guides and seats. Reduces heat by reducing friction. Ian Beveridge, one of our UK customers, won at the Historic Bulldog Rally in Wales the first time out with one of our B20 Rally engines. The report is as follows: " In the Bulldog Historic Rally, which formed the second round of the Dunlop/WONAGO MSA British Historic Rally Championship, the class B4 Volvo PV544 of Ian Beveridge and Peter Joy took the Category 1 win after early pace setters Simon Wallis/Graham Wride rolled out of the lead in their Lotus Cortina. The big old Volvo PV544 showed a clean pair of heels to the three following Porsche 911s (how does he do that?) and Geoff Taylor/Steve Greenhill finished fifth ahead of Edmund Peel/Janet Craine in yet another 911." Our latest batch of progressive rate suspension springs, including more of the new taller springs, has been delayed by problems with the wire delivered to our spring manufacturer. The wire did not meet their specifications, so we have had to wait for a new supply to be delivered before the springs could be made. It looks like it will be towards the end of April before they come in. Starting on 3/25 our office will again be closed on Fridays. This does not mean that we will not be working, but with spring finally here and the race season rapidly approaching we have to spend more time out of the office, in the shop finishing projects, and doing track testing and racing. Not answering emails and telephone calls on Friday will give us more time to work on your projects as little gets done when stopping to answer the phone every few minutes. As usual, please send an email if possible and if you call leave a message on our office line - 315 478 1229.This will usually mean that calls and emails will be returned the following Monday/Tuesday. A very limited number of our new headers, redesigned with a dyno developed merge collector, are due to arrive the week of the 15th, along with more 2.5 inch, mandrel bent, stainless steel exhaust tubing. More of our new, taller progressive rate springs will also be here that week, including sets in black for those who like the stock look along with a ride height that is closer to stock. Its expected that most of the headers and sprngs will be reserved for individual customers before they even arrive, so order early. Another new product, and one that can be used on almost any car, is our custom shift knob. Last year a customer needed a shift knob for his T5 conversion and there was no time to order one, so I turned one out of some aluminum that was on hand. It came out so nice that I made a few more and can now offer them for the M40/41, T5 and T9 and many other transmissions. Adds a really nice solid feel to your shifter, as well as a unique custom look. Several different custom styles are available, or just tell me what you want it to look like - $50. 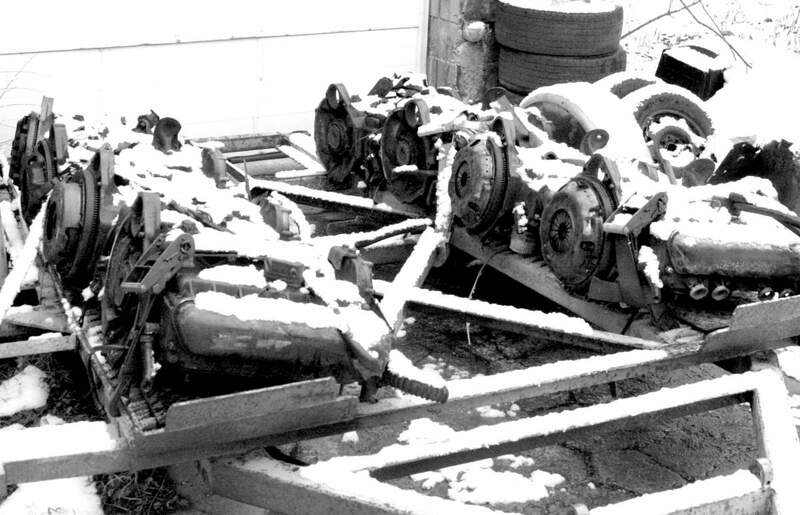 2 degrees on Wed and 160 inches of snow - a good time to do some indoor work, building and testing engines. Though the weather is not helping there either. 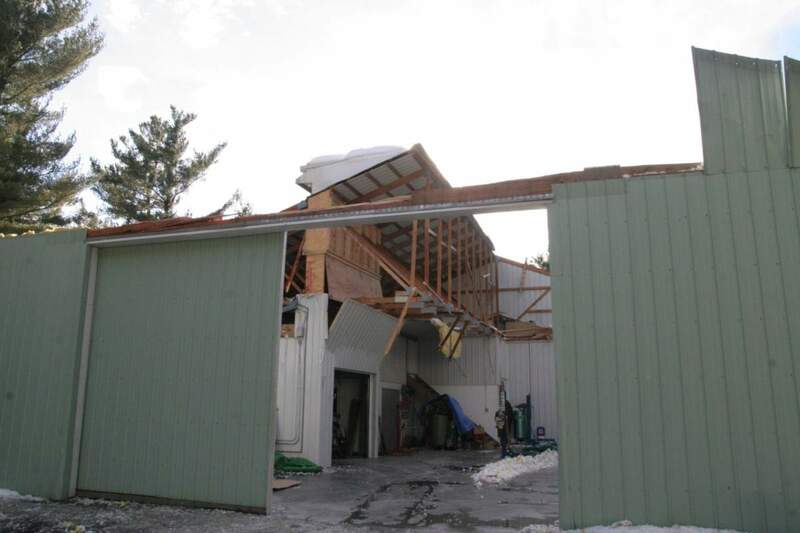 A couple of weeks ago the roof on the shop where we do most of our engine machining and dyno testing collapsed under the weight of the snow. 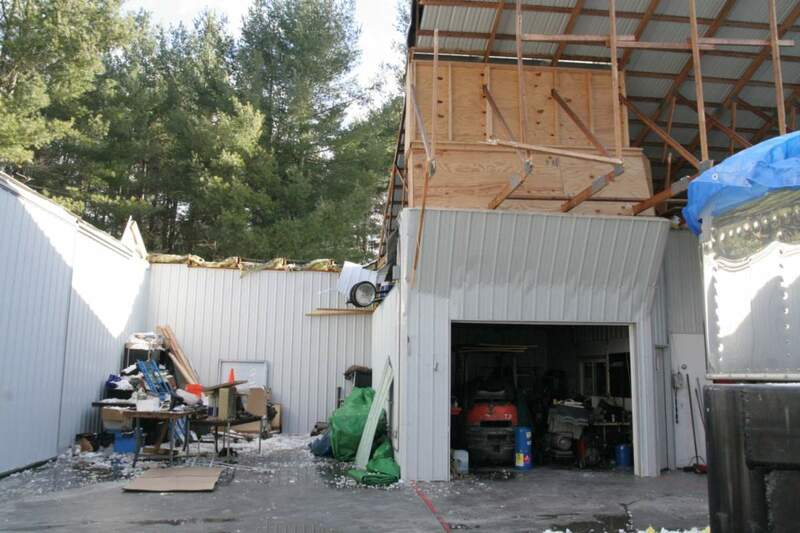 Furtunately, the roof held up over the main dyno and machining rooms, but the cleanup shut things down for most of a week. In the photos below, the chassis dyno is in the bay just to the right of the new "open air" section. The engine dyno room is to the right of that. Last week we had engines on 2 dynos - 240 miles apart. Mon, Tues, Wed, we worked on the dyno in NY - under the section of roof still standing in the above photos. On Wednesday we finished testing a rally engine destined for the UK. On Thursday we prepared that engine for shipping and shipped it by air to the UK for Tuesday pickup at Heathrow Airport. 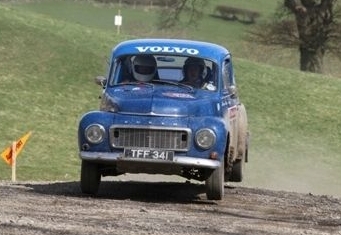 Update - Its new owner used it to win a rally in Wales on April 2nd. On the dyno on Wed - Waiting for the truck to take it the airport on Thursday. On Friday I was in Pennsylvania to finish dyno testing an engine there to be shipped to the West Coast next week. 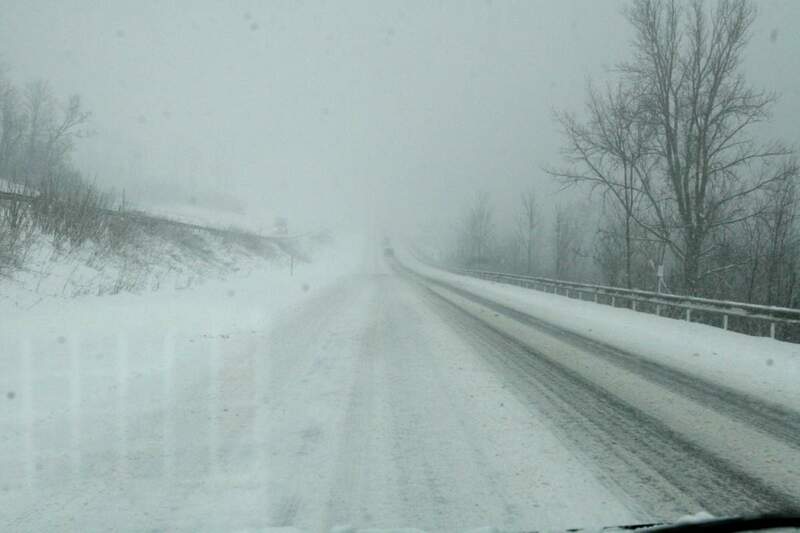 See the photos below of what the first part of that 420 mile trip looked like. 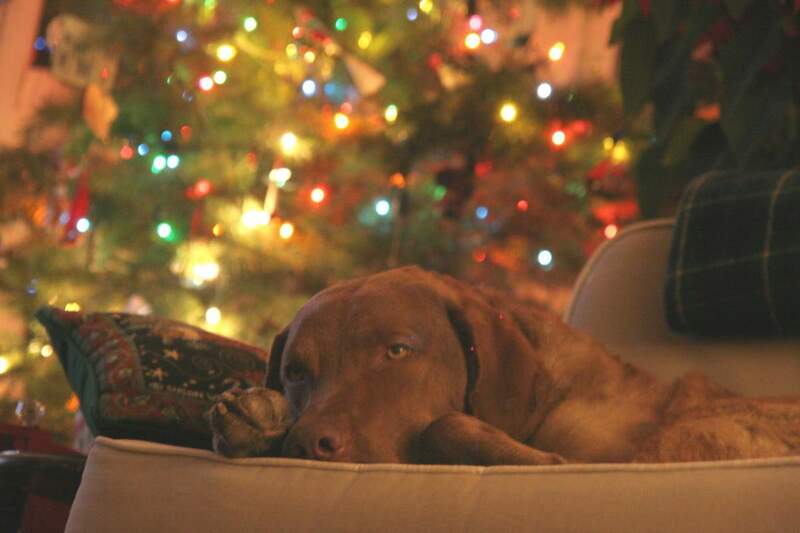 Back to work on several exciting projects now that the holidays are over, except for my dog who is still relaxing in his chair. Some of the projects, such as the new headers, roller rockers, and improvements to the Mikuni Carbs are derived from our fall testing, and I am anxious to get them finished and into production. The new programable 123 Tune Distributors have come in, and are undergoing evaluation as part of our dyno testing program. See more on them in the Ignition Section of this website. 2) A new Volvo B20 4-2-1 header featuring both the current stepped primaries and a new merge collector - totally unique. 3) A new camshaft for our 2.5 liter Volvo B20 engines. 4) New progressive rate suspension spring sets with a wider choice of ride heights, including one that is close to stock. 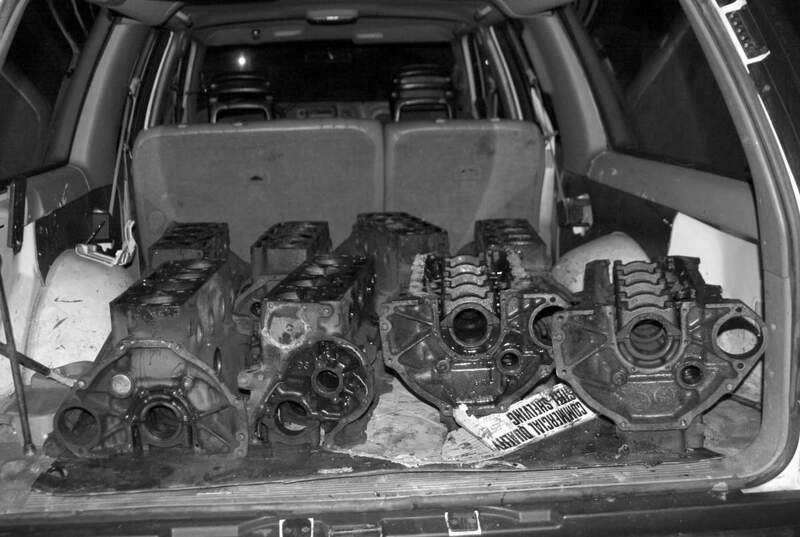 5) The new T9 5 speed transmission Kit. 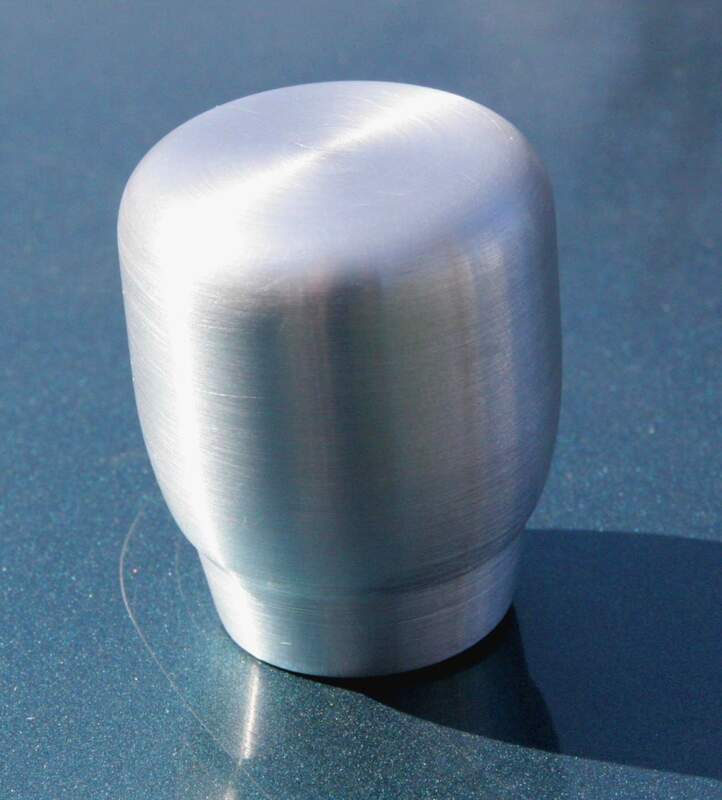 6) Our new custom aluminum shift knobs. 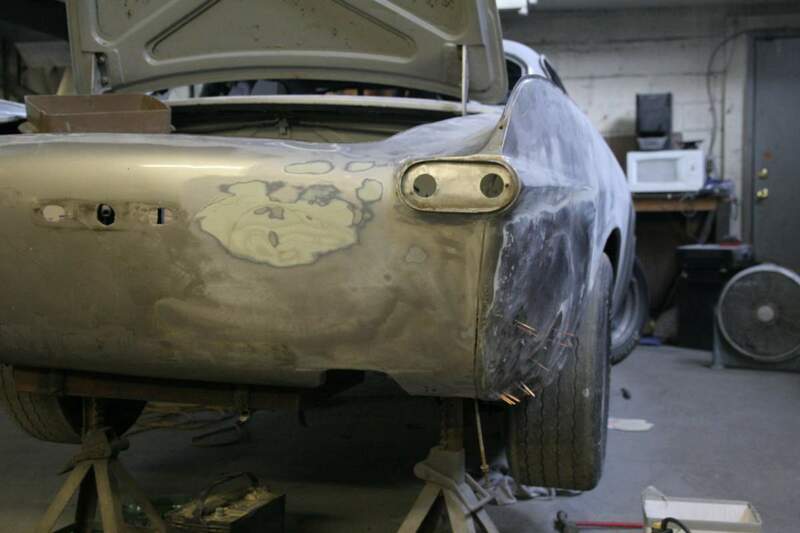 7) Finally some progress on our TR4 Project. A new version of our superchager kit. 46 inches of snow in 4 days,a record 12/5 - 12/8, took us abruptly from fall to the depths of winter. Now, over 70 inches of snow for the first two weeks of December has broken all records for snow in December, including the record for the most snow ever in the whole month, and only 7 inches short of the record for the most snow in any month ever. With this much snow some plans have had to be delayed or cancelled - a 400 mile round trip to do more dyno testing was delayed a week. A 200 mile trip to pick up a TR4 parts car has been put off indefinitely. 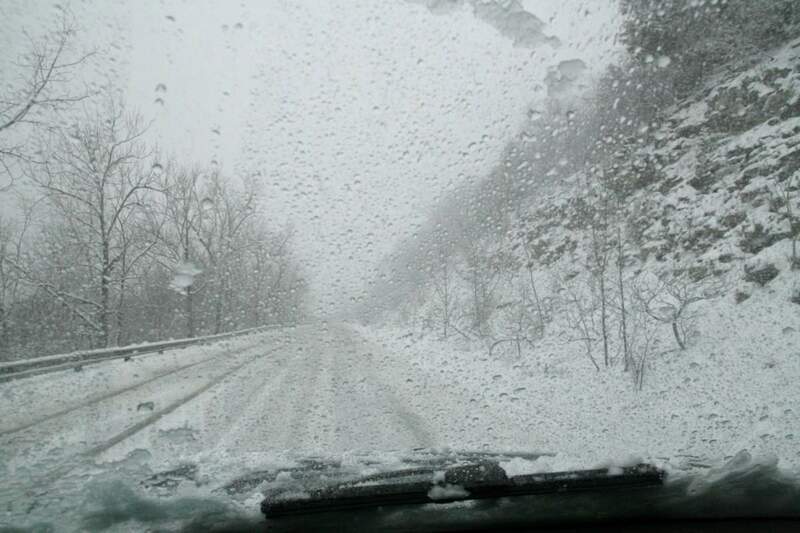 Dealing with old cars that don't like exposure to salt, the first big snow of the year causes changes. Cars tend to stay in the garages where they are as moving them becomes a production. The attention moves from "on the road" to "in the shop" activities, and its a time when we can concentrate on getting heads and engines done. New parts include a roller rocker kit, a re- design for our 4-2-1 headers, more choices in rebuilt T9 transmissions with enhanced availability, aluminum shift nobs, larger valves for our Type 3 heads, and more. Now is the time of year that we do most of our testing and development work, and get things into production so that they will be available for 2011. Back from Watkins Glen. Finished 4th out of 62 cars in Group 3, though a much smaller number actually raced in the rain on Sunday. And just as at Infineon in Cal., it was an Alpha reunion in honor of 100 years of Alphas, and we were grouped with the Alphas. Gary Jebsen (# 41) and Bruce Saunders (# 180 ) were also there with their 1800s. Photos of their cars are below. 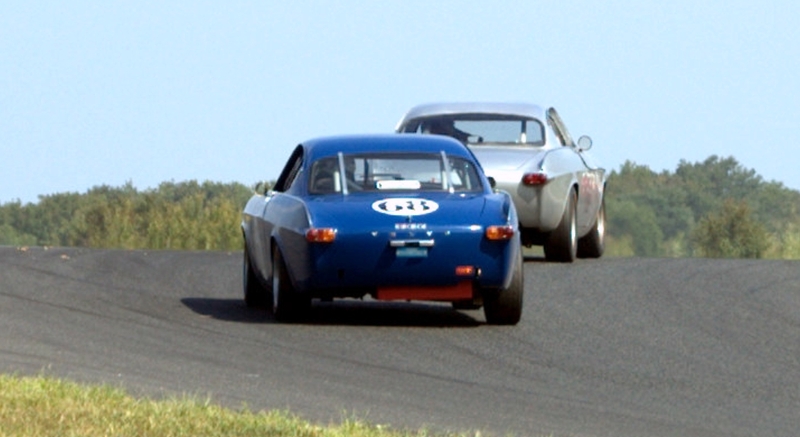 The next race was with VRG at New Jersey Motorsports Park on Sept. 24 - 25. There we had a good reunion and some on track action with another customer and his 1800 racecar. 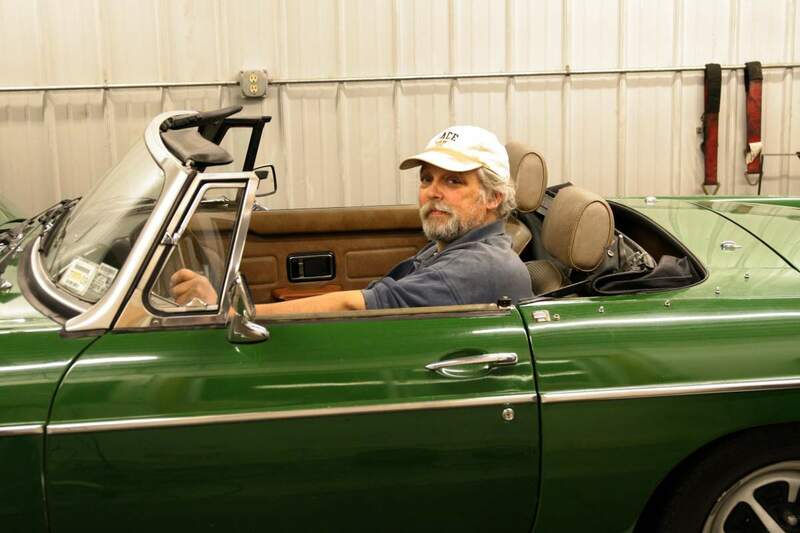 For several years now, Rich Schnable has owned the blue 1800 that started out as Steve Grabski's car, then was sold to Rich Conklin, before it was purchased by Schnable. We have serviced it throughout, but this is the first chance I have had to race against it since Conklin owned it in 2004. NJ Motorsports Park is never going to be one of my favorite tracks, and the flies were terrible, but we did well, finishing 3rd in the final race, in front of all the Porsche's and Schnable who finished 5th. A complete Street Performance Engine, never run, stock rod and piston, .030 over, with Type I head and further upgrade options. At times we have a completed engine available for sale. This is one of those. This engine was built as part of a customer's supercharged car project that was never completed. The car is now going to become a racecar, so the street engine has to come out and is available at a considerable discount off of our usual prices. Currently configured with a C cam and low compression ( 8.7 - 1 ) head for supercharged applications, it can be quickly upgraded to normally aspirated specs by adding one of our Street Performance Cams and milling the head for higher compression. $3000 as is. $3500 with the Street Performance Cam installed and the head modified for higher compression and upgraded to current Type I head specifications. $3800 with the head upgraded to current Type II specs. Add in that there will be no engine core charge ( normally $350 ) and these prices represent savings of approximately $1000 as compared to a new order of an engine with the same specs at current prices. Cash offers considered for immediate sale. We have a standing offer of 10% off the purchase price or free installation of any of our Mikuni Kits where we do not already have a documented installation of the kit on a particular car model. This offer includes extra technical assistance ( including extra jets, fabrication of brackets, thorttle linkage, and air filter adapters if necessary, etc. ) where we do not already have installation and tuning documentation of the installation for that kit on that model. This offer is in exchange for photos and feedback from the purchaser that can be used on our website. Where the car is near us, we will do the installation free in our shop. 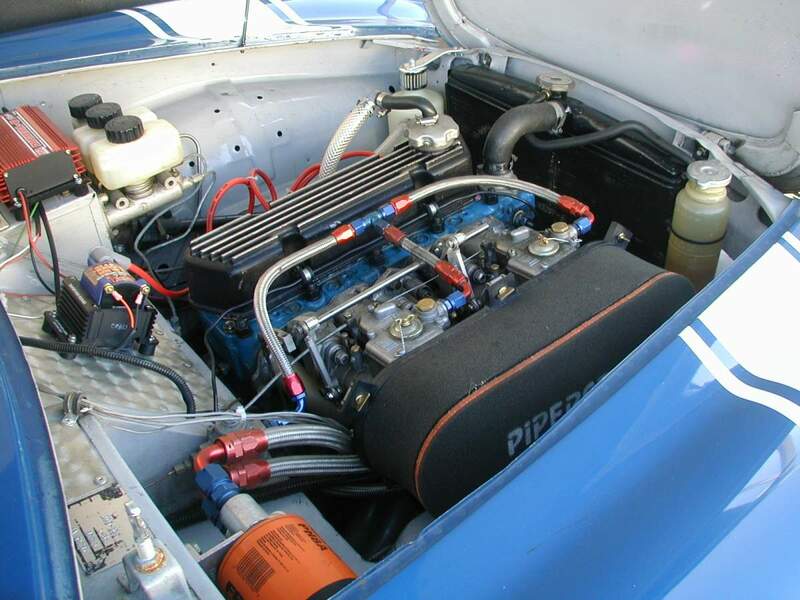 Installations that we would like to do this year include: 4 carb kits on the TR3/4. 3 and 6 carb kits on the TR6. Installation of any of the kits on Datsun roadsters and Z cars, Jags, Austin Healeys and MGC, TVR, etc. Our newest product is an innovation - a programable distributor for vintage cars - $445 as an introductory offer. 123ignition did it again ! If you want to tune your engine, or you have an engine for which there is no standard distributor available.....the new 123\TUNE is the answer ! By connecting it to a computer, the end-user can easily adapt the 123\TUNE to fulfill even the most demanding requirements. The unit offers two sets of curves that can be selected by placing 12 Volt on a wire from the 123\TUNE. - available in 4- , 6- and 8- cylinder models with various sizes and shapes. Got the email program going again, on another computer. What started as a corrupted email program ended up with having to switch to a new computer system - new enough that none of the old programs worked with it - 32 bit vs 64 bit etc. So after a week of recovering data, transferring it over, downloading new drivers and programs, ( and trying to stay off the phone so I could get it done ) it looks like we have everything up and running again ( though the wordprocesses program shut down shut down this morning losing data again ) and are in the process of catching up on emails, orders, and shipping. Let me know next week - 5/17 if I missed getting back in touch with you. Cannot currently recieve emails at our normal email address. We should have this corrected by Monday. Got back late Thursday night from the California trip. Well over 6,000 miles and no problems with the racecar, trailer or the tow car. Photos and story will be posted soon. Now working on catching up. The plan to relay email to me on the road and get some work done while I was away failed when the computer here went down after a thunder storm. Luckily not anything major, but we didn't get it back up until I got back. The above photo was taken by Terry Smith, more photos taken by him and others will be posted in the Gallery section and as part of an aritcle on the trip. I will be doing both in sections as they are completed and the photos from various photographers become available, so you may have to check back several times over the next few weeks to see all of the photos and the full trip story. My son Brad and I left NY very early Thursday morning and did a very quick straight through tow arriving at Infineon Raceway( Sears Point, CA ) late on Friday. Gary Jebsen and I were the only East Coast drivers who made it ( at least with their racecars). There was no representation from the Midwest. 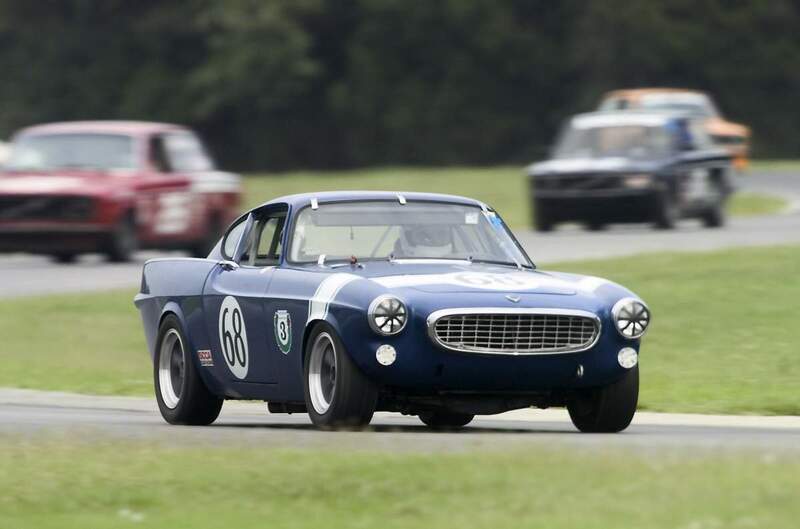 The CSRG vintage race weekend had two featured Marques with their own race groups - Alpha and Volvo. After arriving we got some sleep and had a good day of practice and qualifying on Saturday. The weather turned wet ( very, very wet ) on Sunday. After warmups ( an inappropriate term considering the cold rain ) the regular schedule was changed and compressed into two races. 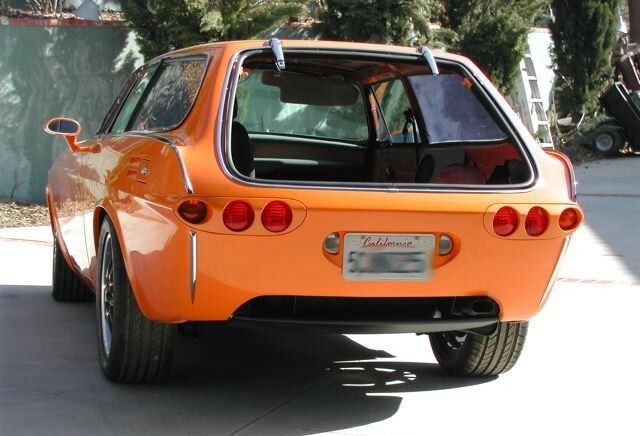 The Volvos and Alphas were combined into one group and all of the other cars into another. It was difficult racing with large standing puddles, water and dirt running down the hills and across the track, and very little visability. 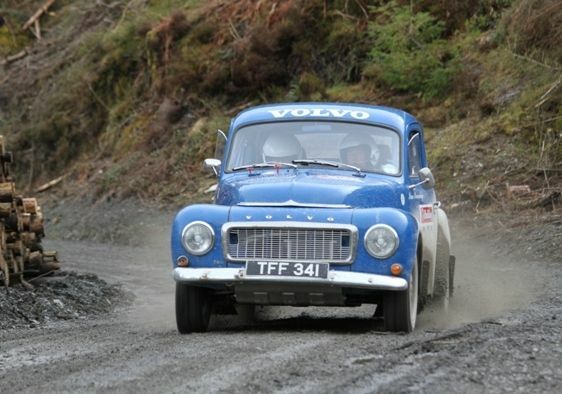 Volvos took the first 3 places against a much larger Alpha contingent. 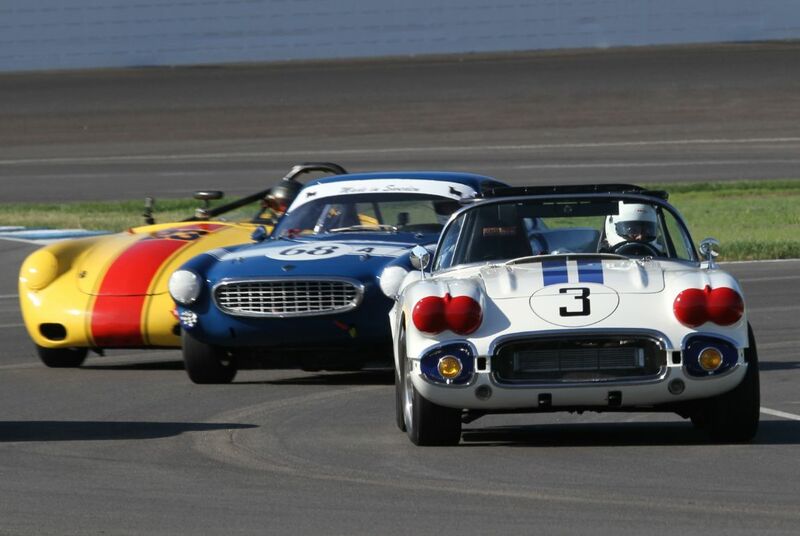 Cars with soft suspensions were generally faster than those with full race suspensions. 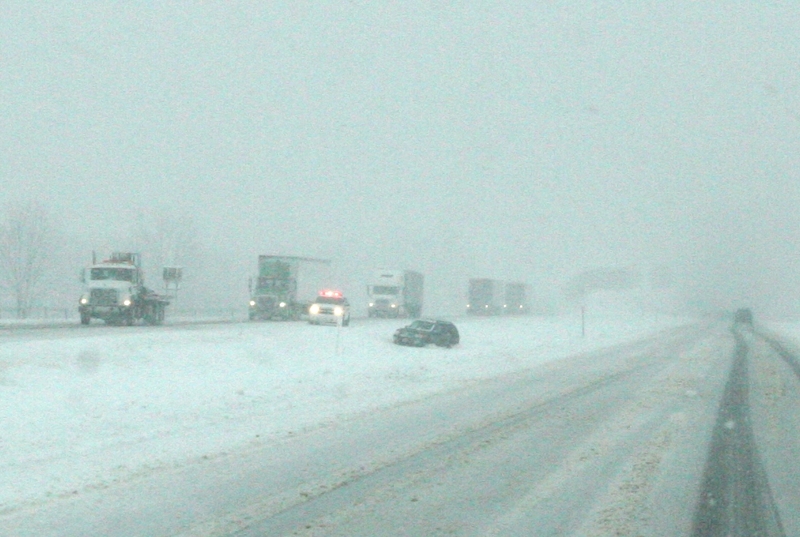 Visability was a key element, and some cars went off the track just because they could not see where it was. After several accidents and off course excersions, the race was ended unber full course yellow. I was lucky to get third place - first 1800 and first of the cars with a full race setup - thanks to using borrowed windshield wipers from a spectators car and an old set of and rain tires from Gary Jebsen. More on the race, including photos, when I get back next week. 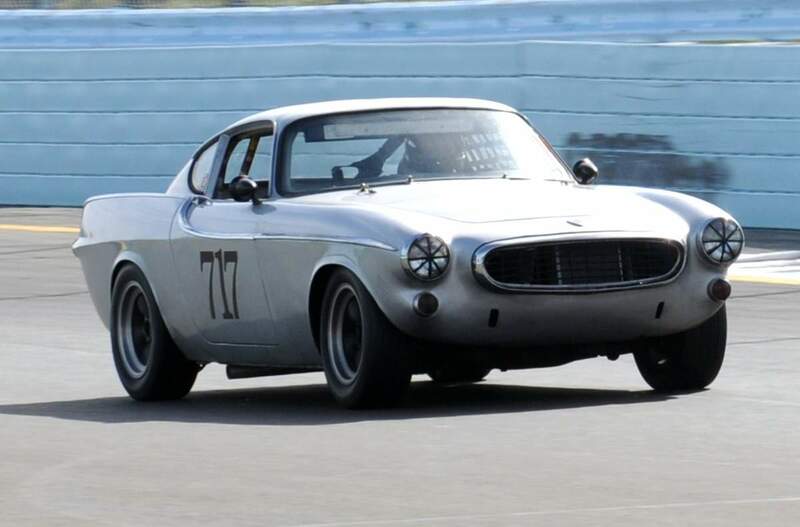 We will be closed for a few days - 4/8 through 4/14 in order to make a race commitment - the all Volvo race at Sears Point - Infineon Raceway in Sonoma, Cal. Assuming that we make it in time we will be joining a group of approx. 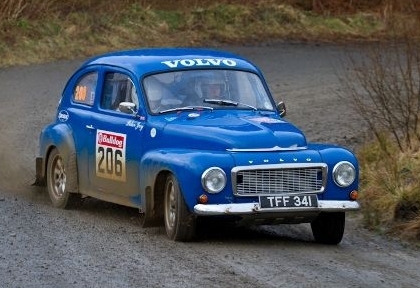 25 old Volvo racers for a fun time. It should be an interesting report when we get back. If you have a project or shipment pending, please be patient, we will get it out as soon as we get back. 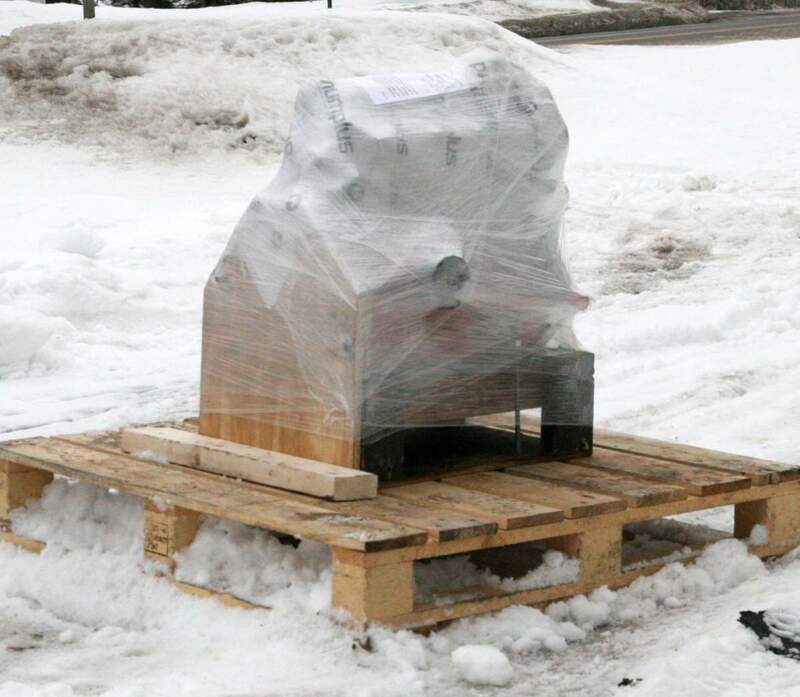 The engine from Vintage Performance is due to arrive on Tuesday. 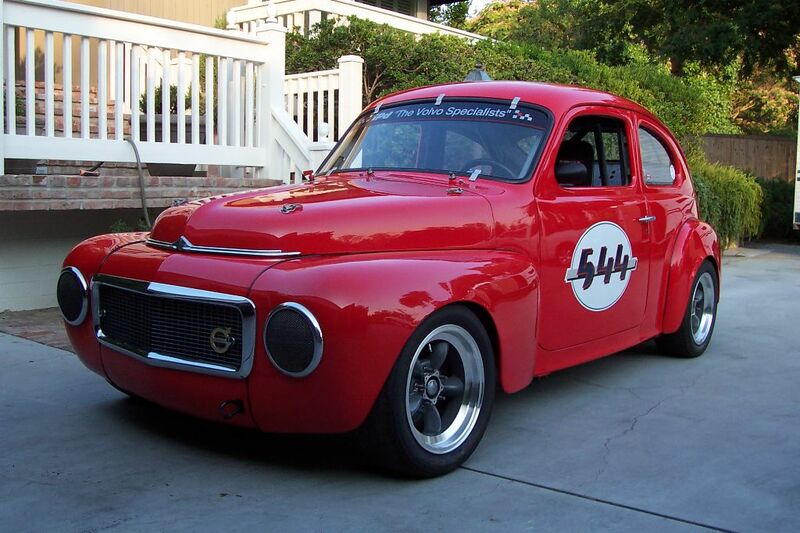 We hope to be at the all Volvo race at Sears Point Infineon Racectrack on Friday. And with any luck I will be out there too. 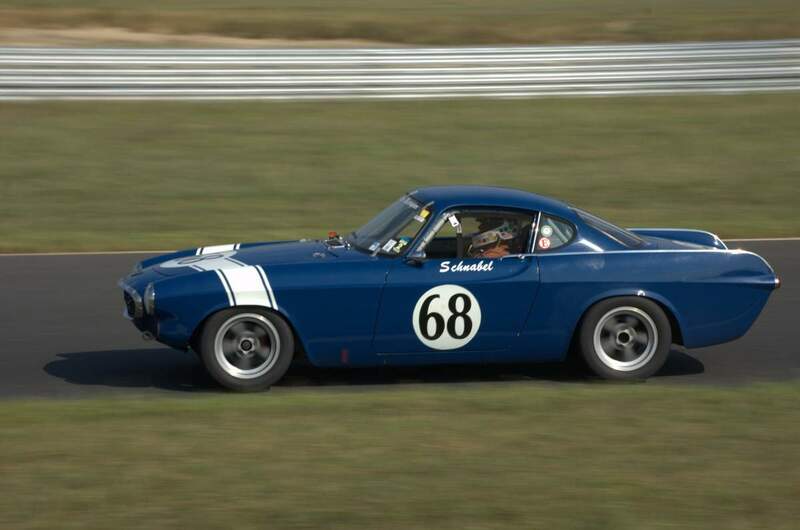 I co-owned this car in the late 'seventies in North Dakota, buying it from the fellow Steve sold it to, thinking to replace my ex-Rich Schnabel (IMSA/SCCA) 122. I decided to keep mine (Still have it as a roller BTW-brought us the 1988 Cal Club/SCCA GT-3 Reg'l C'ship) and part Steve's out. That Steve was able to gather it all back is nothing short of a miracle, as when it left my hands it was barely more than a tub with wheels.I understand Steve and this beast of his have a couple of SCCA runoffs under his belt; no small feat for a 122, even in Michael Schumacher's hands!Can't kill an old racing Volvo! Starting in April we will be closed on Fridays. This does not mean that we will not be working, but with spring and the race season here we have to spend more time out of the office, in the shop finishing projects, and doing track testing and racing. Not answering emails and telephone calls on Friday will give us more time to work on your projects as little gets done when stopping to answer the phone every few minutes. 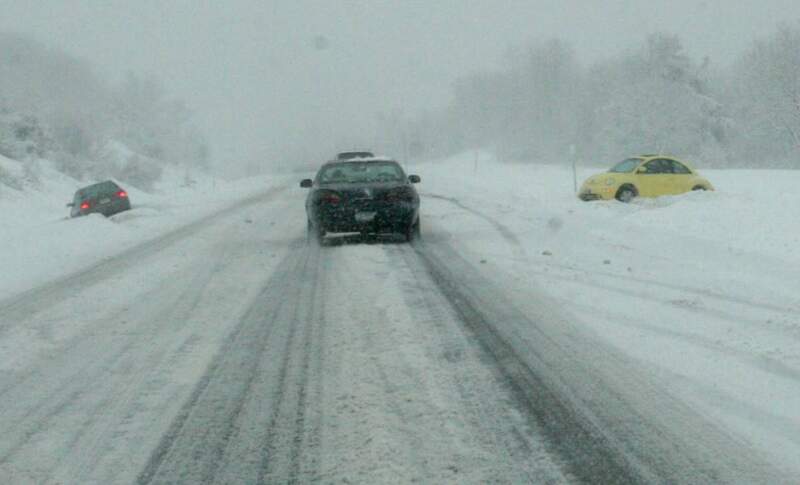 As usual, please send an email if possible and if you call leave a message on our office line - 315 478 1229.This will usually mean that calls and emails will be returned the following Monday/Tuesday. Now available in limited numbers, we will be getting more each week. Added to the Mikuni carb section are Datsun 510 & 1600 installations, polished carbs, reduced prices on the Quad carb kits, and additions to the tuning instructions in the "Articles" section. Last week's trip took longer than expected, but finally back with 4 more engines on the trailer. There appears to have been problems with telephone messages left while we were gone, so if you tried to call and/or left a message last week, please call again or email. We will be closed Feb 12 - 15th including a trip to pick up more engines to use as cores for our performance engines. We will be back late Tuesday. See the engine section for details on price changes, including reductions for 2010. As part of the annual rush to get engines ready for spring, I picked up 8 more B20 cores on a 700 mile trip to Long Island on the 14th through 16th. Together with 6 we already had, that made 14 engines to take apart. Those are now apart, cleaned and are being sonic tested so that we can select the blocks to be used for our various engines based on cylinder wall thickness. The next step on the blocks will be align honing the mains. The cranks are being magnafluxed, checked for straightness, and being balanced. The rods are being reconditioned and ARP rod bolts installed. And I have quite a few heads to do. 1) lower cost cranks and rods; 2) new cams; 3) mushroom lifters; 4) roller rockers; 5) new head configurations. These are just examples of new developments for 2010. Stay tuned for additional details. In order to meet the need for parts, now that traditional sources are out of stock on pistons and other key engine rebuild parts, we will be stocking all of the parts needed to rebuild a B20 which we can sell individually or as a kit. There will be price reductions on our stroker engines, both the 2.3 L and the 2.5 L , as volume purchasing of custom parts has allowed us to reduce our costs and these reductions will be passed on to our customers. We are building several motors for rally and Carrera Panamericana use by our customers, and have used the opportunity to do some testing and development work which will have a positive impact on our pure street engines as well. It should be an exciting year for engine development. Best wishes to all of our customers and hoping you have a happy new year! Changes and updates to the website done during our "off week" will be posted during the first week of January. Included will be dyno charts and more racing photos. January and February will be spent building engines and porting heads so that we can get your projects finished by Spring. Richard finished 1st in "Historic A" in his 122 which featured a number of our products. 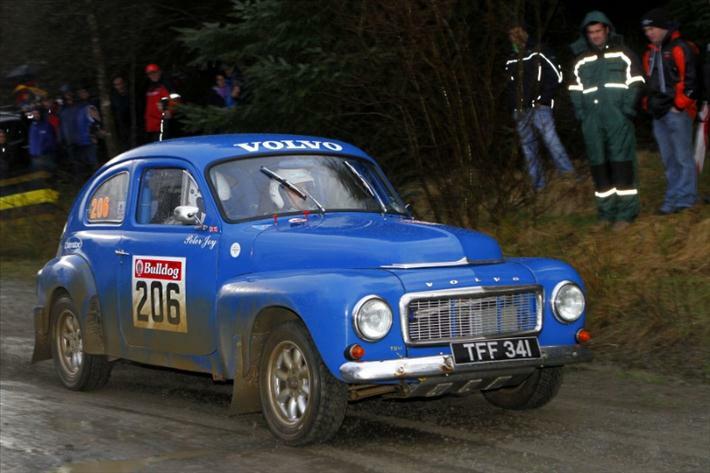 Photos of his and other Volvos in the race have been posted in the Galleries section, with more to come. Contact us to see if any of these specials are still available. Reduced prices on the 2.3 L B20 engines, the 2.3 L component kit ( $350 off ), and/or individual orders for the rods and pistons in the kit are offered for a limited time. Discounts will depend on the which parts are ordered and the quantity, and will range from 10 - 20%. We are currently putting in orders to our suppliers for the custom rods and pistons we will need to build these engines for 2010, and can pass on our reduced cost based on a larger order. Discounts are also available on the parts for race and rally engines if ordered in the same time period. This offer is limited to those orders placed from Nov. 25th through Dec.15th 2009. Please email for details or to place your order. We will also be closed from Dec. 22nd thru Jan 3rd. We are constantly improving our products - with some of the strongest efforts directed at our race products. This year our Volvo B20 head development and testing program produced big dividends - modifications that produced significant increases in power, verified on the dyno & on the track. These head flow improvements were applied to two of our older race heads with great results - dyno tested power increases of from 20 to 30 HP, without other engine changes. See the dyno chart below. These modifications have now been incorporated into the design of our current generation of B20 race heads. On the track the improvement is quite evident as soon as you open the throttle. The next step will be applying some of the same improvements to our street heads. Look for new versions of the Type III and the new Type IV heads in 2010. 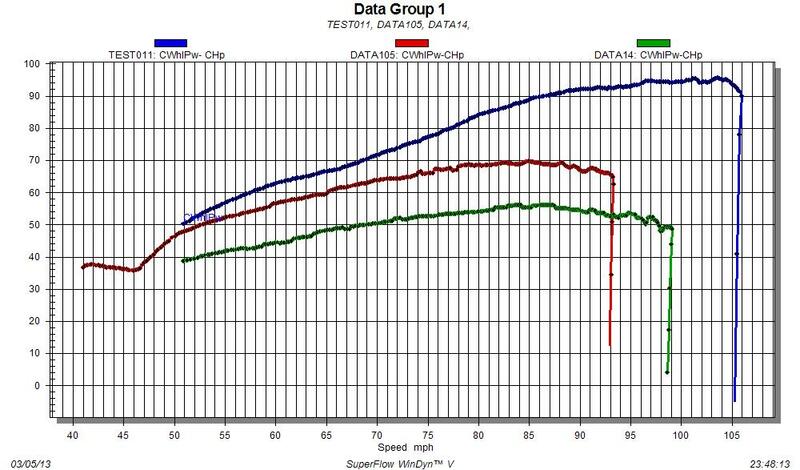 The dyno chart below shows a comparison of power and torque at the wheels using the same race head before and after modifications. The solid lines are after modifications, the broken lines are before modifications. Red is torque, blue is HP. Stock type Volvo B20 pistons no longer available through the usual US sources are now in stock. We have located and imported several sets in popular oversizes. They should be available here by the 3rd week of October. If there is sufficient demand we will keep several sets in stock. Contact us by email for details. The computer problem that wiped out emails received before 9/23/09 has been mostly fixed, with recovery of the emails but not the indication of which have been answered. So if you are waiting for a response from a recent email, please resend as we may have missed it. . Finally back on the track in October - the familiar silver/grey Vintage Performance 1800 has finally finished undergoing a much needed body and paint restoration. 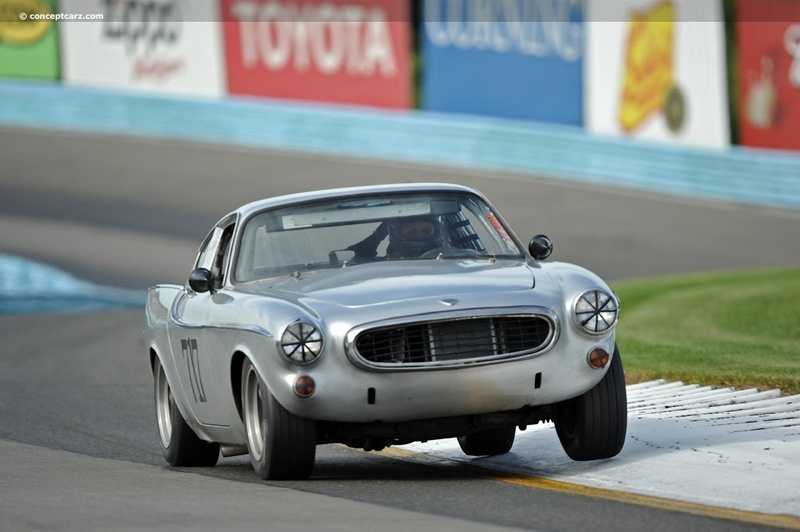 After a further delay to take care of teething problems with the mostly new engine, we made it to Watkins Glen Oct 16 - 18 with the Vintage Racing Group. Its kind of a strong hint that the racing season is coming to a close when its snowing when you arrive at the track. The car may now look "new", but underneath it's the same car we have been racing since 1989. With a couple of track sessions this fall used mainly for testing, we have a full season of racing planned for 2010. Photos of the car's original construction and the recent restoration will be available on this site soon with a few excerpts shown below. The ground work has now been done for a full season of racing next year, with the first events only 4 months away. See you at the track. The photos below show the car as we found it in 1989, as it was last raced, and undergoing body work in August, 2009. A close look at the "last raced" photos will give some idea of why some of the bodywork was necessary. 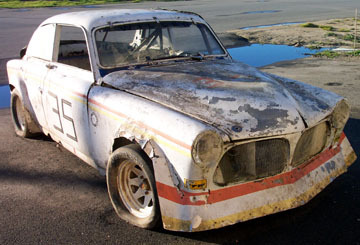 Over 75 race weekends, including more than 300 track sessions and over 2000 individual laps, takes a toll over the years. There ended up being a lot more that needed fixing then we estimated so it took a little longer than planned. Below are photos at Watkins Glen this October. After moving up through the pack to 4th place, a broken axle ended our chances of winning. Maybe it was the additional power, or just that we have been racing on that axle since 1990. In any case, it is all part of the process of finding out what still works and what does not, what needs improvement and what does not. Adding power can have a ripple effect, causing problems that were never there before when the stresses were less. So the first races back after making significant changes are always part of the tesing process. 2010 Update -- After taking everything apart, it turned out that the axle broke when the transmission locked up. 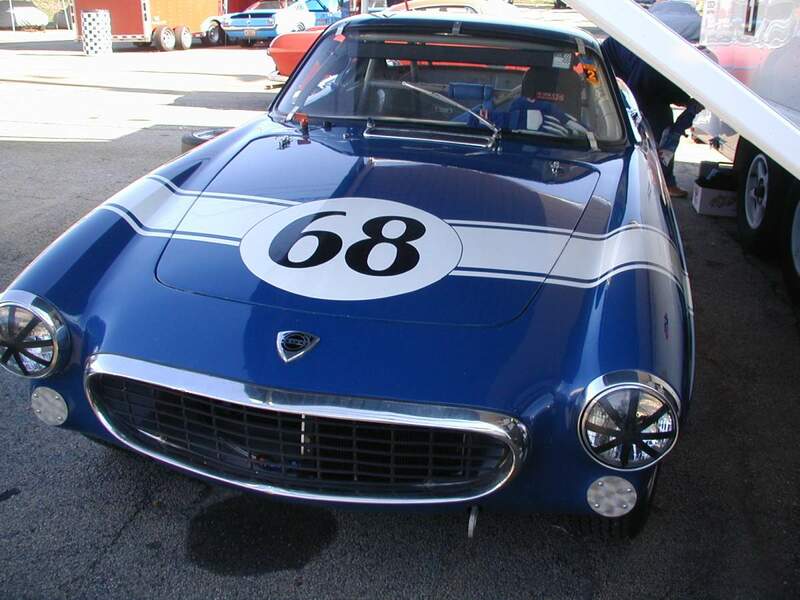 Everything else was in good condition and worked perfectly during our first event in 2010 at Infineon Raceway in Sonoma, Cal. The office and shop will continue to be closed on Fridays thru October.This does not mean we are not working, just not in the office. If you have to get hold of me regarding our weekend activities while we are closed, try my cell phone 315 440 6560. As I will usually be in areas with very poor cell service, do not assume that I will get messages right away. 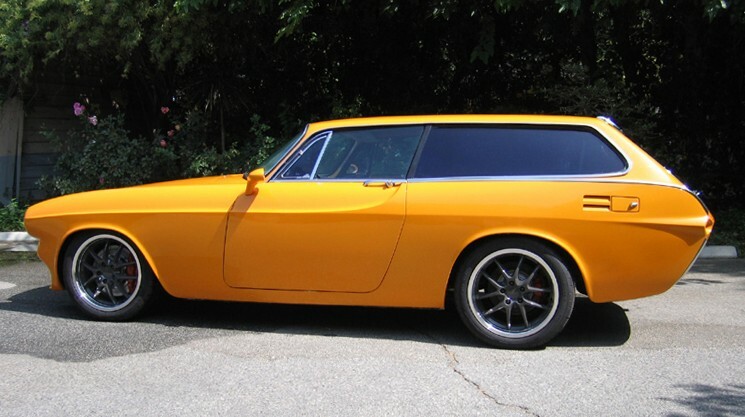 New photos of this customized 1800 are in the Customer Car Gallery. The old pricelist has now turned into a really cool printable parts catalog. Its the "Printable Price List" shown at the bottom of the products listing. We are adding more stock type Volvo engine parts to our inventory as they become unavailable in the US from other sources such as IPD and Volvo dealers. Engine bearings, oil pumps, and cast B20 and B21 pistons are currently being added. We will soon have updates posted on pricing. Let us know what parts you would like added to our inventory. Tell us what you like about it, what you don't, and what you would like changed. We would like to make it as user friendly as possible and include as much useful information as possible. Thanks to our site designer, Steve Berry, I can now make daily changes to the site, in order to keep it up to date and keep you better informed. 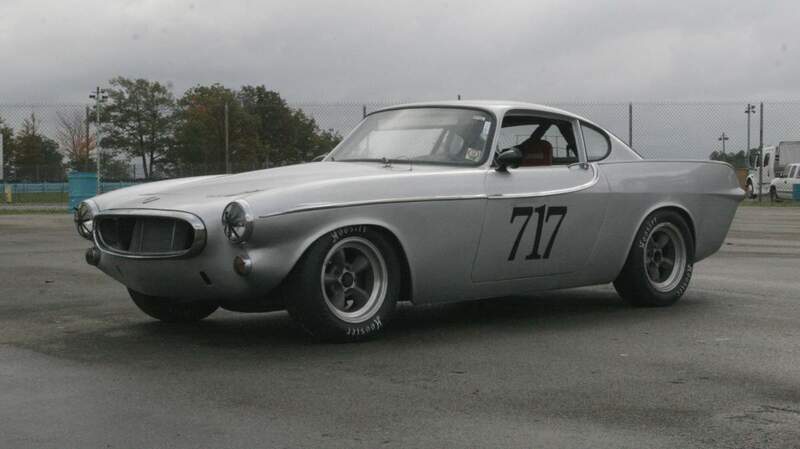 Even the old articles, like the "Vintage Volvo Perfomance" series is being updated with new information, new photos, and additional parts that are coming out soon. So expect something new every few days. 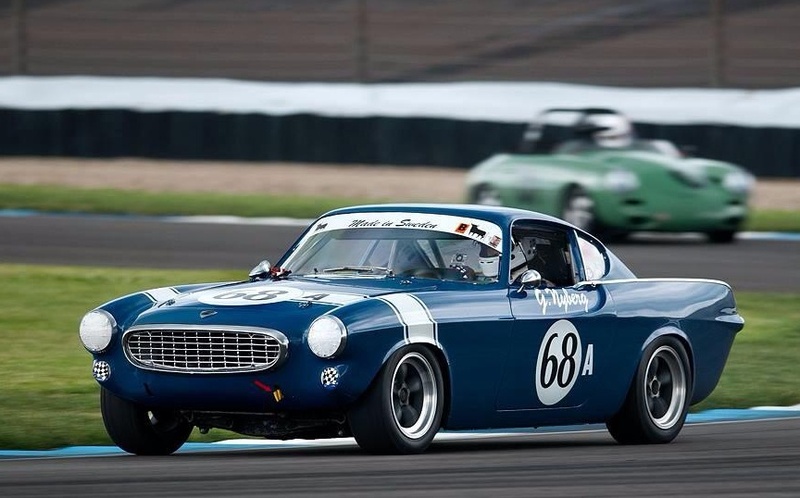 A new section of photos of Volvo racers has been added to the photo galleries. Most of these are old photos and in many the driver, track, year, and photograpgher are unknown. Your help is needed in providing this information. More photos are wanted, so if you have any, please email them to me. We will be closed July 3, 4, and 5 for the 4th of July weekend. Back on the 6th. Have a great holiday weekend. Photos now posted in the Products/Cars section. 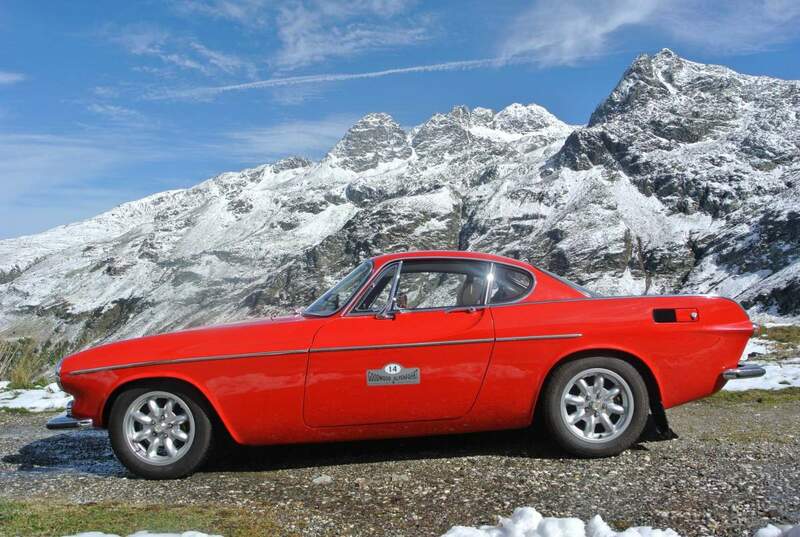 One of our customers has asked us to sell his P1800 that is currently in our storage garage. He lives outside of the US and has decided that the cost of transporting the car is more than he wants to spend. The car is in decent running condition, although it has not been on the road in several years. It has a new interioror and comparatively new paint though there are areas that need some additional work. The body is basically solid with no obvious rust problems. 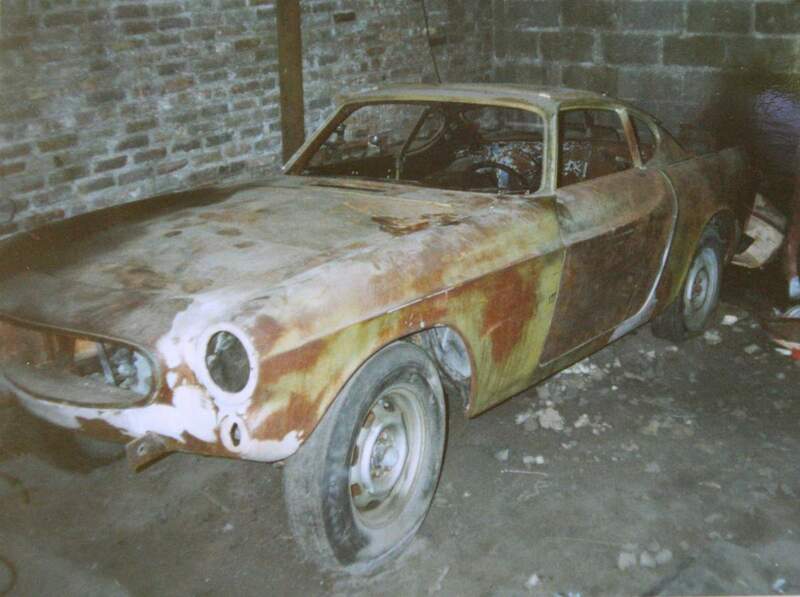 Not a show car, but could be a fun daily driver in its present condition, while needing some body and paint work in the future to bring out the car's potential. See photos in the Products/Cars section. Email me at jparker3@twcny.rr.com for details. $5200. Sold for $5,000. 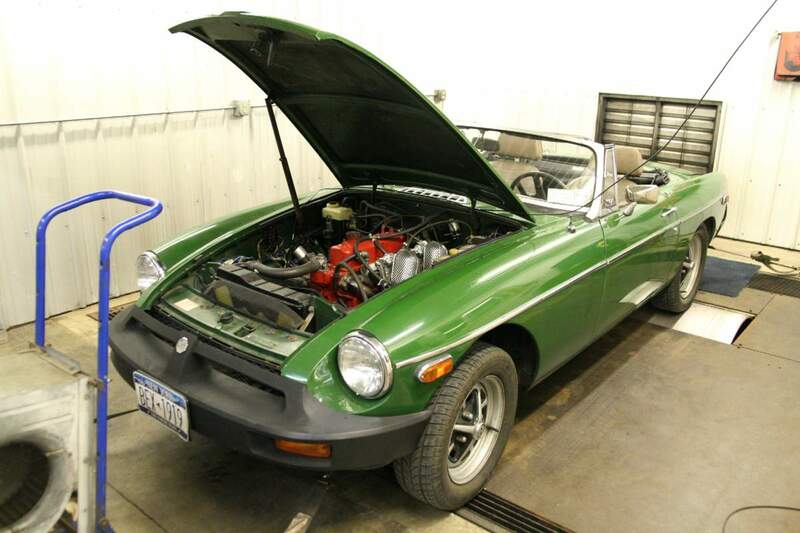 Finally got a chance to do a dyno test of the 79 MGB with the Dual Mikuni Carb Kit. 95 HP at the wheels! That's as much as Moss Motors gets with their supercharger kit. This car originally had a single Zenith Stromberg carb. The Mikuni carbs were added as part of an engine rebuild so we did not get a chance to do a before and after test . ( Using Moss Motors dyno tests as a comparison the rear wheel HP is almost double the stock engine output. ) Other changes besides the carbs include a "fast road cam" , head porting, and a header. The car is very responsive and really fun to drive. The dyno results show why. As the car was very sensitive to timing changes and had the stock distributor, I would be looking to get another 5 HP or so with a distributor like the "123" where we could get a more accurate high energy spark and could control the timing advance curve. In the chart below, the blue line is wheel power. Red is wheel torque. Black is power at the crank. All are with STP ( Standard Temperature and Pressure ) correction factors. During the course of 11 runs we gained about 10 HP with changes in jetting and timing. Torque at the wheels peaked at 93 ft lbs at both 3500 and 5000 rpm, but was essentially a flat curve between those peaks. Engine power reached 130 at 6200 rpm, with the "at the wheels" figure being 95. More complete data is available for anyone who is interested. Work on the new website continues, with new items being added on an almost daily basis. The newest are articles on head porting and head identification. While we still have products that have sold at the same price for more than a decade, last week we had to increase the prices on several products in order to pass on cost increases from our suppliers. While we had been able to hold the line on prices for several years, when our re-order cost for some items was higher than our listed selling prices we had to make some changes. Another issue is that several of our normal suppliers are no longer carrying many of the stock parts for the B18/B20 and B21 engines. Although I am sure that we will find other sources, this may mean temporary delays and further price increases for the individual parts and for our engines. Let's hope that these trends are temporay. 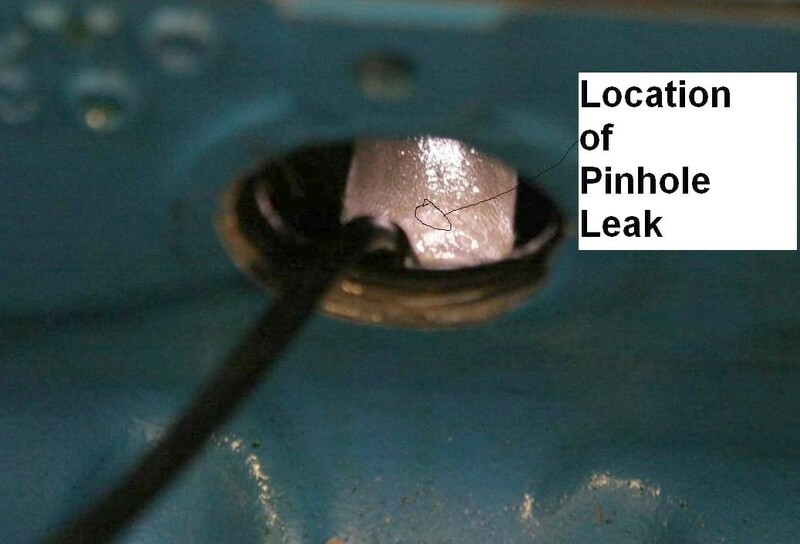 After 8 years, an unusual problem in one of our B20 race engines - a pinhole internal water leak from the cylinder water jacket into the lifter gallery. Right now we have no idea what caused it, but are at least happy to have solved the question of why there was water in the oil. Looking a lot like a spitting cobra, the photo at left shows the pinhole leak - its the white line in the middle. It took almost 40 lbs. of pressure on the system to make the leak into a spray so that we could see it. Is it just a coincidence that two of our supercharged 1800 owners are going to Spain for the next 2 weeks? Including our site administrator Steve Berry just as the new site is going online ? With over 100 of our Mikuni Carb kits sold, we now have Mikuni Kits in the cars listed below. All owners have been surprised and amazed by the improvements in throttle response, power and fuel economy.